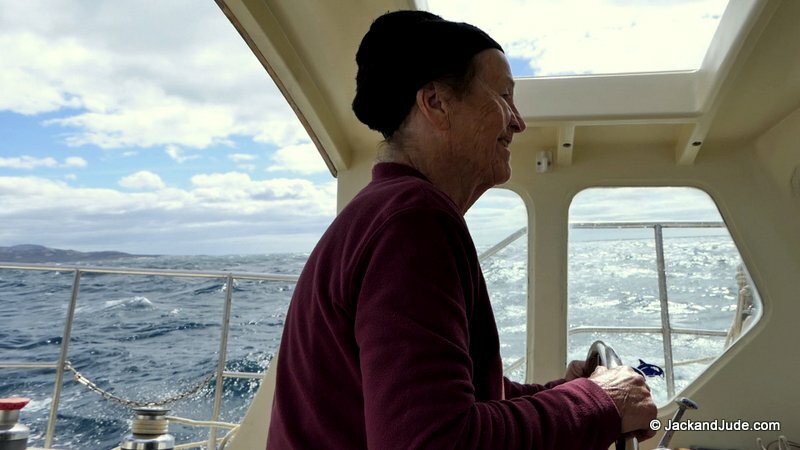 After nearly two years of peace and security inside Macquarie Harbour, the word daunting came to mind when we considered leaving that safe haven to sail the wild Southern Ocean. 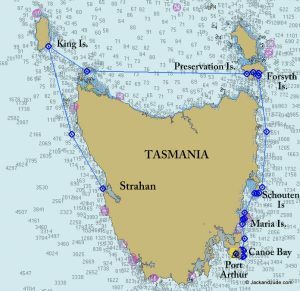 For such a long time our ship had been a palace of serenity surrounded by beauty, so just thinking of leaving that behind and trading it for the unexpected to forge across some of the most feared waters in Australia had our brains mentally shivering with weird thoughts of a dismasting or cracking open our fifty-year-old hull. For sure Jude and I have earned our sea-legs, little used these last 22 months. But, oh my, as we prepared our ship and ourselves for the challenge we wondered if we were up to the task. Mind, the weather ahead looked good, a mere 20 to 25 knots with the wind right behind for the period of our exposure. And while that meant we’d be rolling like a pendulum suffering heartburn, all we’d have to do is hang on and let our ship take the punishment. Decision made, announcements proclaimed, we had to go. Or did we? 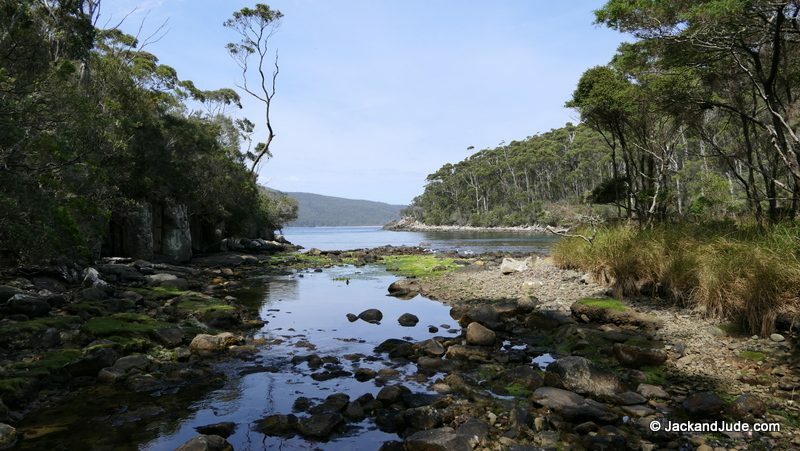 A little saunter to the green forested hills bordering the fabulous Gordon River seemed an attractive alternative. But no, it was best we test our once mighty sea legs. And so, with a little cuddle in the cockpit we promised each other that we’d take it easy, rather than suffer a fall and break another bone, or worse, suffer a compound fracture when far off Tasmania’s west coast. When the first weather window arrived, we passed it up as it came on the backside of a middling LOW that was compressed by an emerging HIGH. Hmm, possibly a roaring lion with blustery conditions and rain, when what we really wanted was a purring pussycat. So we kept tackling our list of jobs, until three days later the perfect weather picture appeared on our screens – a big slow moving HIGH, a fat bubble more likely to bring steady winds. After a better than expected sleep, the morning of our departure arrived bringing southerly winds laced with grey clouds dropping steady cold rain. Burr, it took a bit of insanity and plenty of pluck to climb onto the foredeck in pouring rain to roll up the awning and fold the sail cover, all the while wondering whether leaving another day wouldn’t be a better idea. 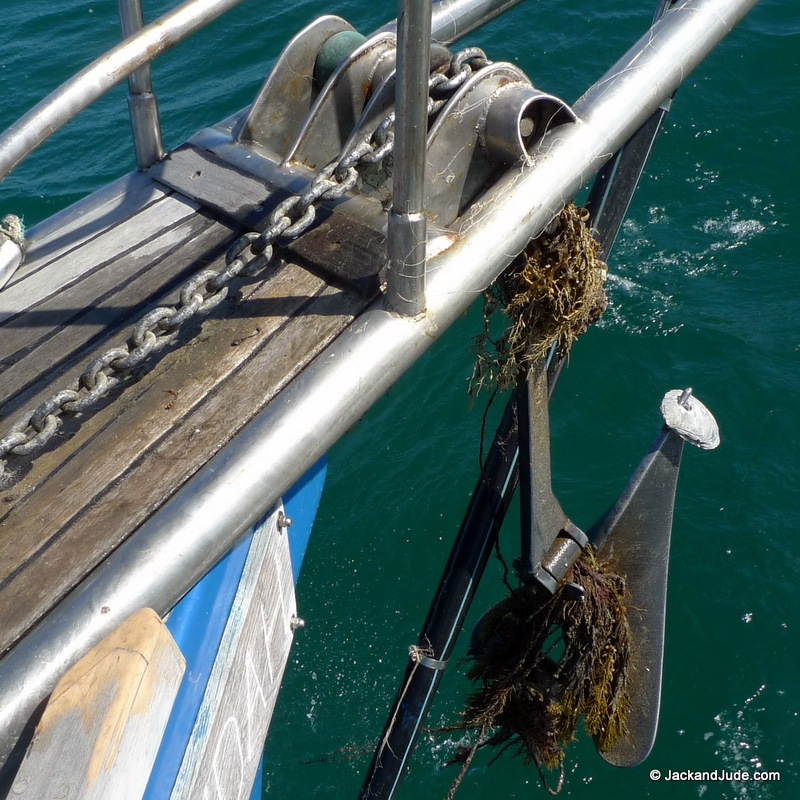 Dropping our mooring lines sealed our fate, especially when Jude pulled back the engine throttle to have Banyandah closing towards the narrow exit of our bay. 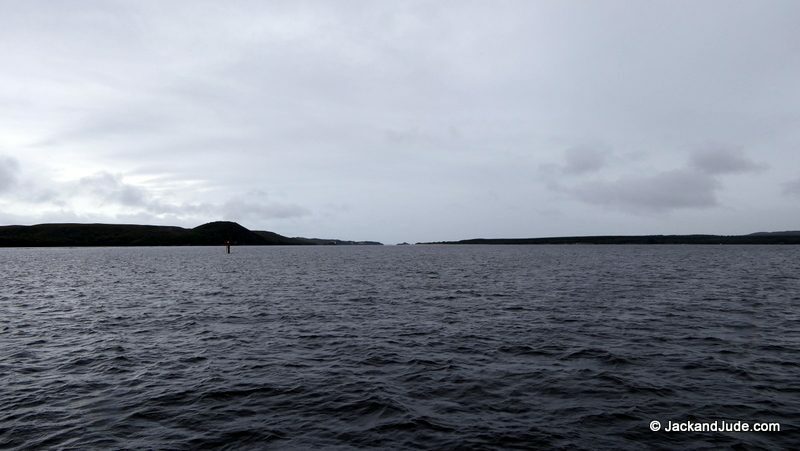 Once out its protection and into Macquarie Harbour we found ourselves bashing into a head-sea with spray flying back at us that jerked our lazing eyelids wide open. It was a good thing the roar of the engine kept conversation to a minimum or we might have discussed letting this opportunity pass. 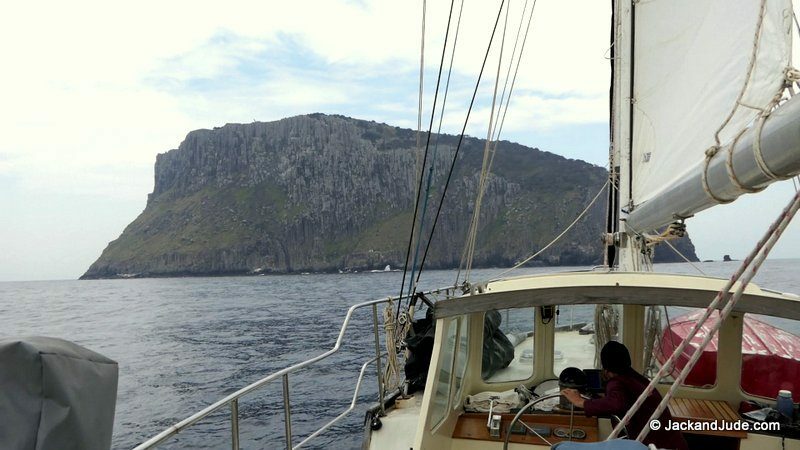 But, made of tough stuff, we braved that cold wet with an eye on the ship’s clock as Banyandah crawled at a snail’s pace towards the channel leading to Hells Gate. Our day began to brighten once we turned into the channel and took the wind on our beam. Now our wind-assisted passage raised our speed to over seven knots, adding a new liveliness to our ship. As if that wind breathed new life into our sluggish ship, she took off like a greyhound, her motion responding to every blast adding even more excitement to shipboard life. And as she came to life, so did her crew. Smiles widened. Eyes brightened and our gaze searched ahead to the opening looking for the limitless horizon. Assisted by a fast outgoing current, at lightning speed the infamous Gate approached while we took happy snaps and rushed about like headless chickens, checking again that everything on deck was double lashed for we were irreversibly going out into the wide blue ocean. Then, Whoosh! Out we went through that narrow gap that had put fear into so many long ago. But unlike those sorry convicts of the 1820s, our hearts were lifted towards the stratosphere to see such vast distances expand to infinity. This euphoric feeling increased dramatically when miraculously the wet misty rain suddenly ceased. 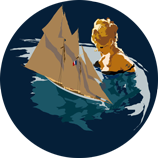 It was as if the heavens had given us a “Get Out of Jail Card.” A fresh breeze now filled our sails, lifting us off that dangerous coast and setting us towards our destination one hundred and forty nautical miles up the coast. 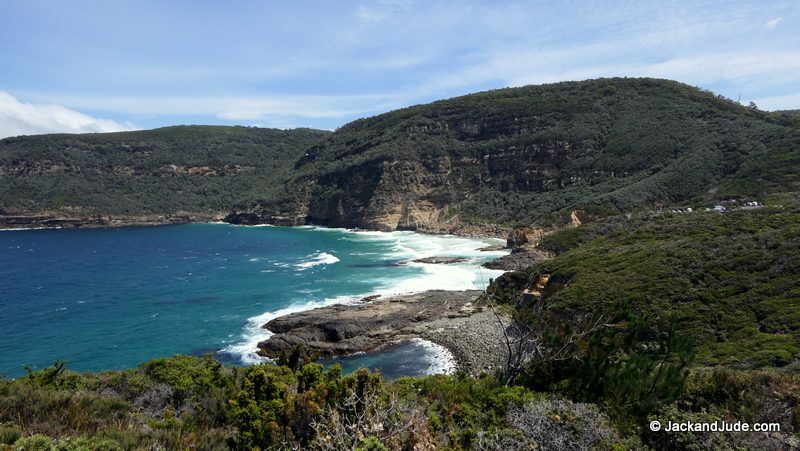 Gone were the pleasant placid waters as Southern Ocean swells swept round Cape Sorell setting Banyandah rolling and swaying. But thankfully our bodies remembered the motion as the friend who had accompanied us on so many other adventures. With a widening smile, Jude swayed a jig in tune to its melody, while I played a rollicking tattoo with my feet trying to find balance. Then Sir Aries was engaged to take over the steering duties, letting two lovebirds embrace to celebrate successfully escaping those dangerous shores. Then the long hours of sail began and straight away we were entertained by old friends when a pod of porpoise began cavorting back and forth across the bows, riding our bow wave. Oh, what a grand feeling it is to stand at the very front of our craft with unlimited views and feel the power of Nature driving us forward, and then gaze down to those beautiful sea creatures effortlessly matching our speed. And then be thrilled to see them roll over to exchange eye contact. We could communicate with them is our belief. Which begs the question of why do we humans put so little importance upon Earth’s other creatures? Hunt them, kill them, eat them, exterminate them seems human’s way. So is it any surprise that Jude and Jack think humanity is missing the boat? After a small lunch, I stretched out for a Poppi nap while Jude stood head and shoulders above the dodger gazing at the passing sea and fluffy clouds replacing the dwindling shoreline. 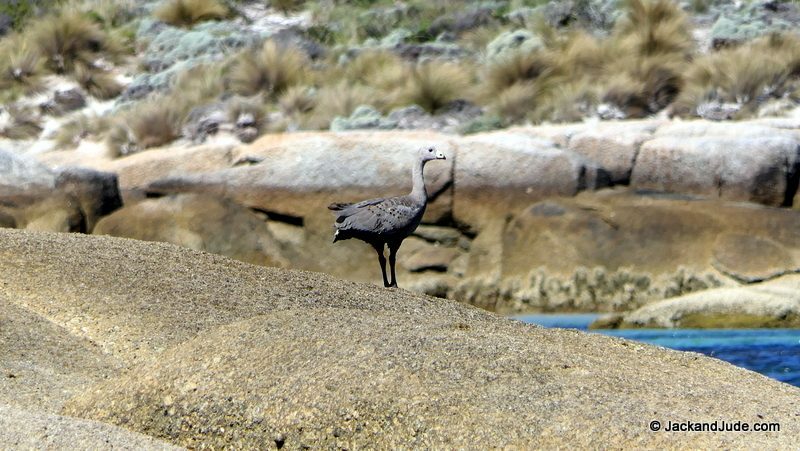 She had her big Panasonic in hand capturing images of Nature and the occasional Australasian Gannet with their gorgeous bright yellow head, brilliant white body, and long pointed beak dive bombing school fish close to our vessel. Snuggled in my bunk below, I could hear her oo’s and aahs rise all the louder when a majestic albatross glided past our rig with turned head to examine this new creature entering its domain. We had promised each other that we’d play it conservative and so I sent Jude to bed when it was still sunny and bright at an early six o’clock. Aboard Banyandah, we change watch at midnight. Six hours on, six hours off watch. Long watches gives the off watch time to get a good rest. We don’t always sleep, quite often the first day we just rest, eyes closed, mind blank if we can. With Jude in bed, I picked up a handy book, in this case, “Longitude” by Dava Sobel. It’s an exceptional book about an amazing man, John Harrison, who created the first accurate sea going chronometer which made finding ship’s longitude possible. Rather amazing, his first clock was made entirely of wood! 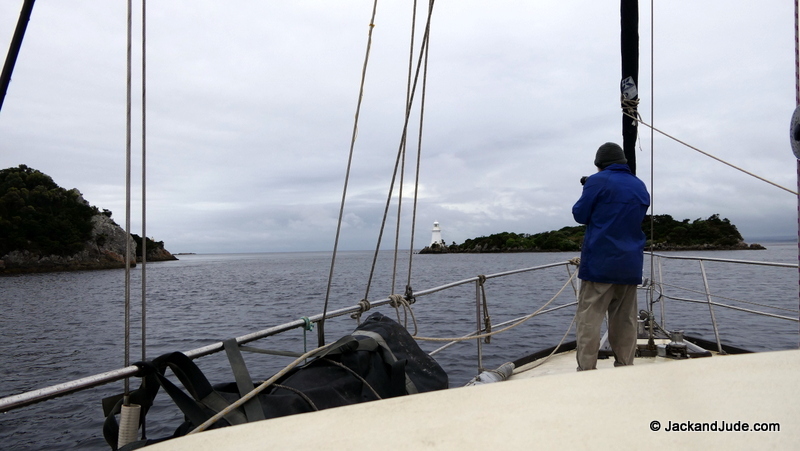 About nine PM, we sailed past the Sandy Cape lighthouse flashing once every five seconds and should have changed course for King Island. But we were still taking the wind on our port quarter, and with our ship rocking smoothly, I left Sir Aries doing its thing instead of getting Jude up to gybe a sail to run downwind, figuring what’s a few miles off course with nearly a hundred to go. At midnight, and now six miles further out to sea than our rhumb line, I got Jude up, and while she rubbed sleep from her eyes I made a yellowbrick waypoint and recorded the log then prepared myself for my first deck work at night in a very long time. I was still wearing our watch keeper’s safety belt comprising a high intensity strobe light, personal EPRIB, and a “Mobilert” pod that sets off a screeching alarm and logs the position if it should go underwater or loose contact with its controller. Nevertheless, I put a harness around my upper body, then a life jacket over that. Before leaving we’d checked that the deck lights still worked, but it was so reassuring to see our decks bathed in good working light. Ours are LED which take little power, not like our old quartz halogen ones that we’d only leave on the briefest time needed. Our new course to Grassy Harbour would put the wind on our starboard aft, requiring gybing the mainsail then poling out the headsail. Doing that required the furling headsail be rolled in. Jude took control of the helm to do that, and then working together we rolled up the headsail after first blocking the wind from it with the main. Following that, gybing the main was easy-peasy, and with its restrainer secured on the port side, we were safe to run straight downwind while I snapped onto our lifeline to go forward to set the pole for the headsail. That also went smoothly as it should considering how many millions of times we’ve completed that task in all kinds of sea conditions. 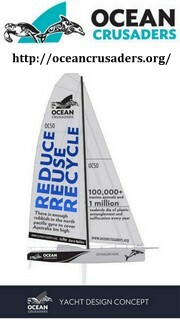 Then finally, out came the furling headsail to its full length, poled out opposite to the mainsail to sail wing n’ wing. Reengaging Sir Aries, I again went forward, this time to check that all was good and correct, and to take up the slack on the pole downhaul that’s secured to our bollard. 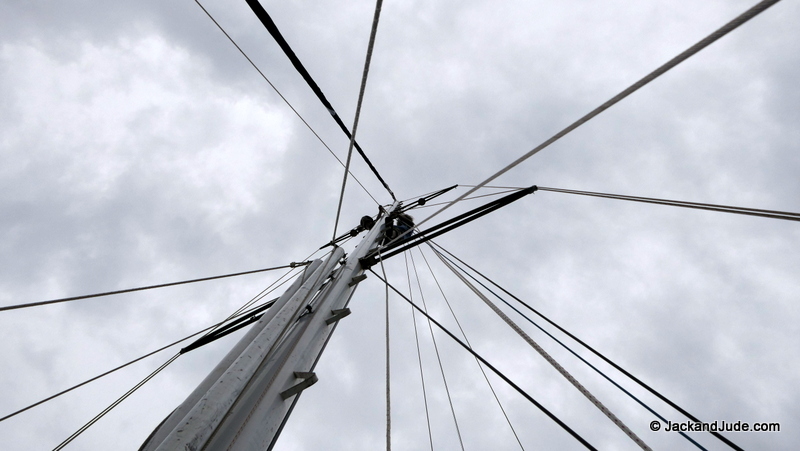 Then I checked that the pole was correctly against its mast attachment ring – which it wasn’t. We’ve got a customized arrangement for our two poles, one for each side that are permanently attached at their lower ends so that we don’t have to attach the pole to the mast, but just lower one using its topping lift. Occasionally the lower attachment slides off the bearing point and when that occurs the force is taken by lashings, which if left unchecked could wear. We don’t like that. 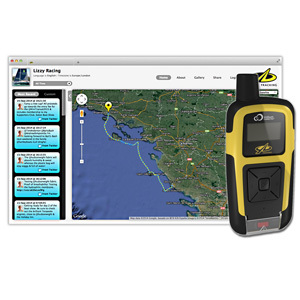 Chafe is a sailor’s nightmare leading to bigger problems. So I had Jude slacken the furler’s sheet while I gave the pole a shove into its proper place. Unfortunately, I was wearing new Ugg boots while doing that work while standing atop the upturned tinny, and I slipped. How easily accidents occur! In a flash, I was on my back, head next to the passing sea. No real problem really, unhurt, not even winded, but it could have been worse. Guess I’ll never be wearing those lovely warm Ugg boots while doing deck work ever again. 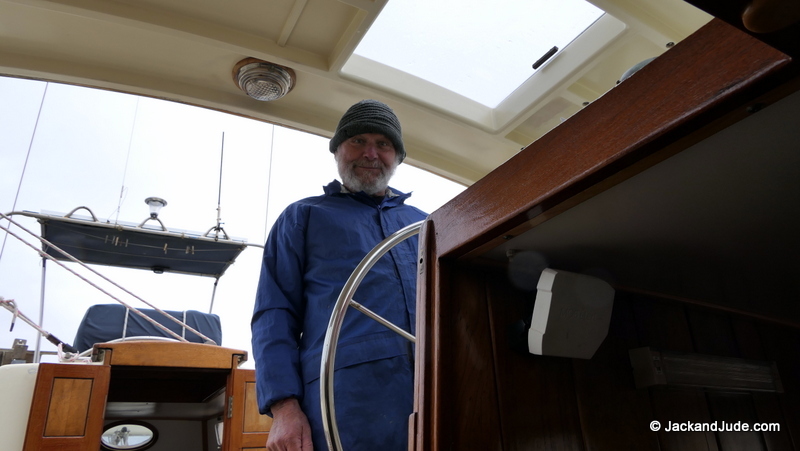 Work completed and a new course set and the dangers ahead noted, I setup the hammock fore and aft in the stern cabin, and then jumped in, a doona under and over me to keep warm. Amazingly, the sea was fairly gentle, just an easy rock back and forth that my mind soon shut out. Whacko, I fell fast asleep. At first light, a little after five AM, I opened my eyes believing I was in a steady bed. 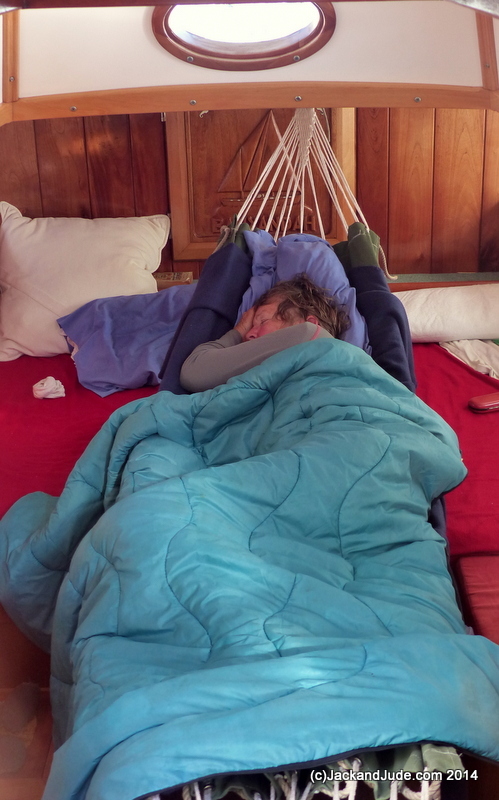 But knowing how it would be once out the hammock, I turned over for a few more winks in heaven. Jude was nearly a zombie when I first saw her lying back against the settee struggling to stay awake, and after one quick cuddle saw her toddle off to hot-bed the hammock and instantly fall asleep. Dodging Bell’s Reef to starboard with fishing lures trailing astern I hoped to attract a yummy yellow fin tuna. Alas, no strike! 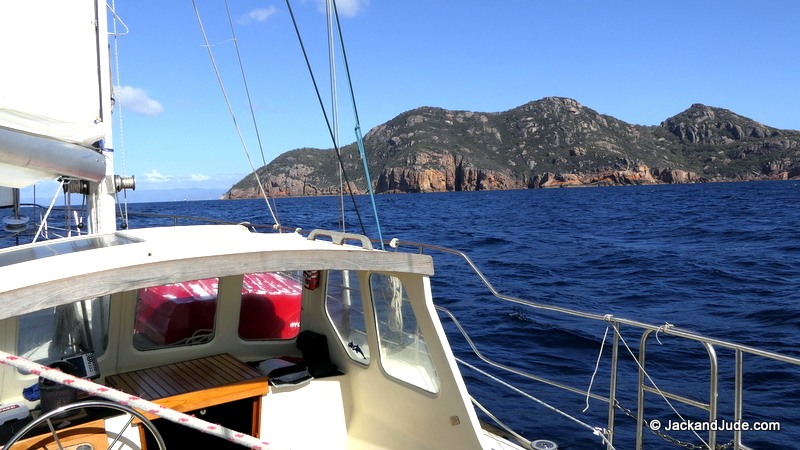 So, clicking Sir Aries a couple of times to port set us heading directly for Grassy Harbour 15 nautical miles ahead, a perfect 18 knot southerly breeze propelling us nicely towards our destination. 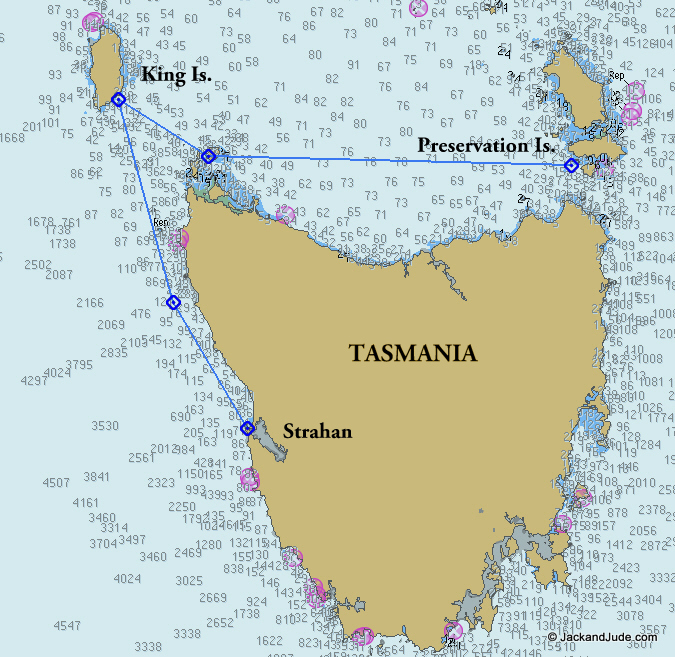 King Island, notorious for taking many lives in horrific sea catastrophes, was named after Governor Philip Gidley King by Captain Black in 1800, but was first discovered by Captain Reed in 1799 while hunting seals in the schooner Martha. 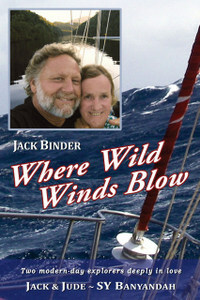 Like all sailors should, Jack and Jude have a high regard for its treacherous coast and challenging weather. One slipup, like a trailing rope caught around a prop, in fact, just about any miscalculation can put lives and ship in harm’s way. With that knowledge, we double-checked our ship then together we went over our forward plan. 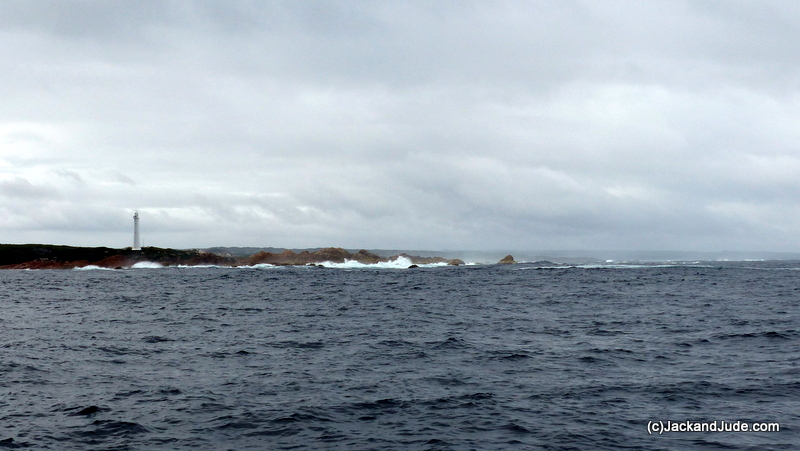 King Island is relatively low and flat, therefore sighting it, especially on that cloudy morning, was a long time coming. 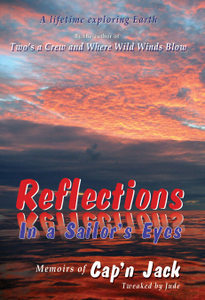 In our early sailing days using only a sextant to navigate, that would have been unsettling. But using today’s chart plotters, we simply watched our blinking icon creep closer, narrowing the distance to our destination. 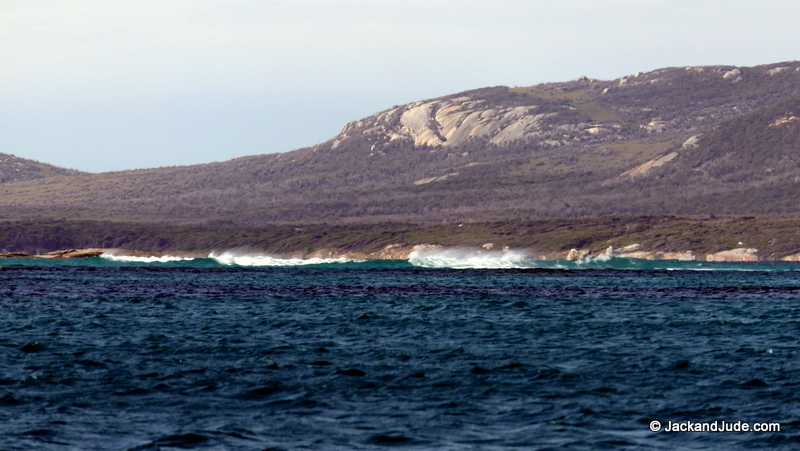 The King Island coastal waters are dotted with isolated reefy bits, reminders that this is a dangerous place. Surprise Point is one. And many other horror points have been named for ships that crashed into these steeply rising rocky shores. 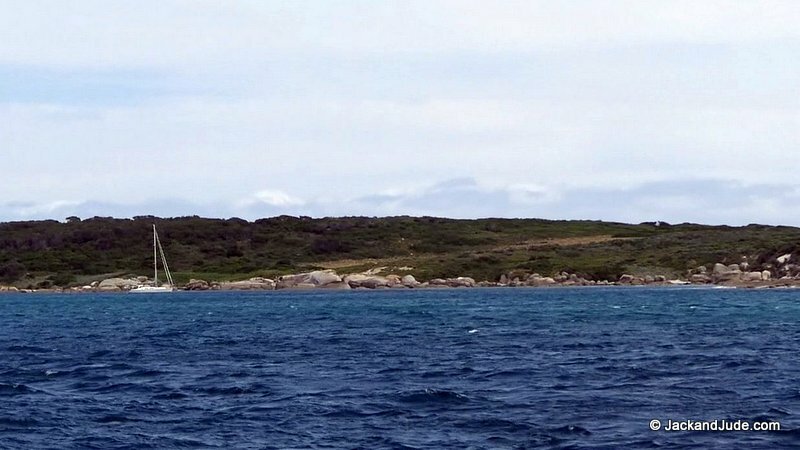 “It’s like nature’s own mincer” says historian and author Luke Agati of the array of sharp and semi-submerged rocks just offshore. 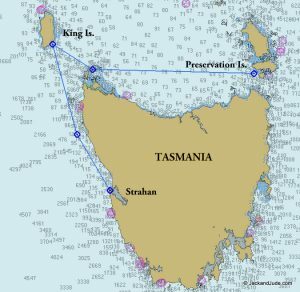 There have been hundreds of shipwrecks around the coast of King Island claiming over 1000 lives. Like the Cataraqui wreck in 1845 where only 10 survived, killing 400, a great many of whom were women and their children. 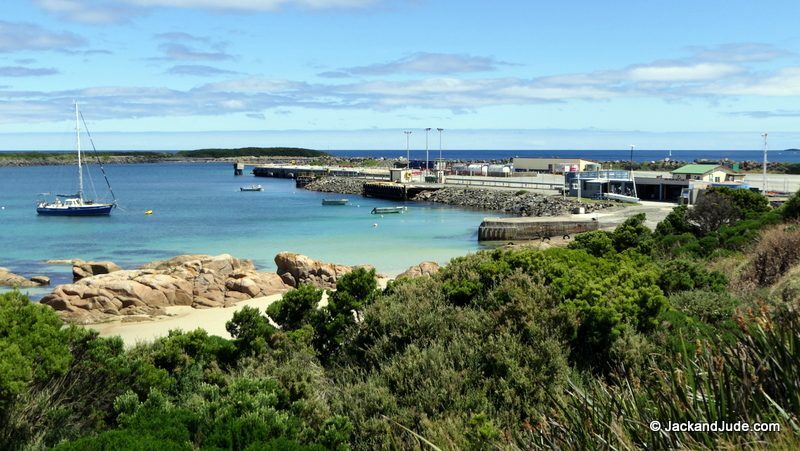 We’d chosen the southern entrance to Grassy Harbour even though it is a bit shallower than the channel north of an obstacle the locals call, Oh my God (Omagh) because it just suddenly appears when you’re right next to it. Doing this allowed us to hold the wind and not have to gybe the mainsail in difficult circumstances. 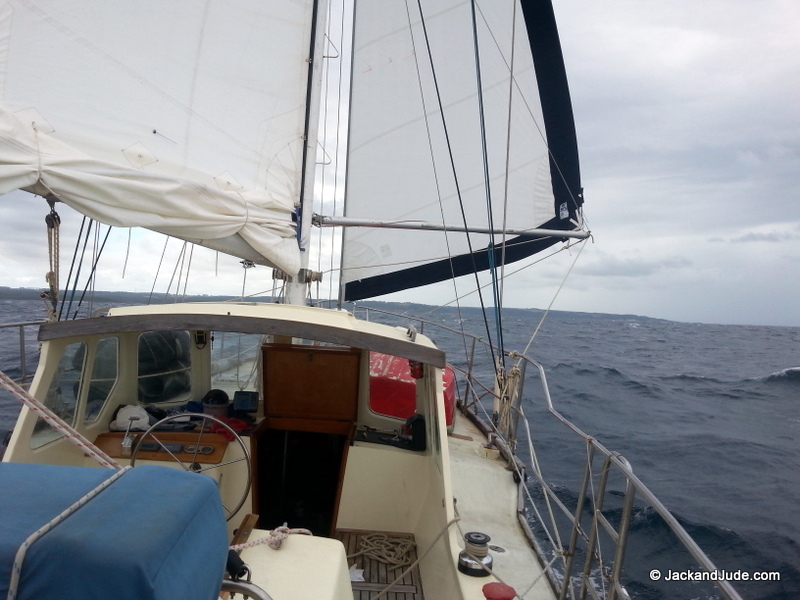 Rolling up the furler as we came abreast of the hard to see Omagh Reef on our starboard side, Jude then shaped a course for the harbour entrance while I made ready to furl the mainsail. Like Harrison’s wooden clock, it all went to perfection and in a flash Banyandah was once again enjoying placid waters with beautiful scenery. Our friends John and Lyn had organized the use of a mooring right in front of the sailing club, and its bright yellow disk made it easy to spy as we entered the harbour. So within minutes, we were easing our lady up to her new home, where Jude dangled the boat hook to retrieve the mooring’s painter. We have taken much from this challenge. One, do your homework diligently. Have confidence by not being careless even when conditions are easy because Nature can pack a surprise for the arrogant. Plus we have taken renewed confidence with our masterful homebuilt craft that has plied the seas since ’73. She’s probably older than many of our readers. She’s a good vessel made of simple materials, easy to maintain, stout, and sea friendly, even if she likes to swish her tail at quartering seas, and roll a bit when the waves come from right aft. Christmas is upon us in just a few short days. Another year is ending, bringing 2019 filled with the promise of many more encounters with this mighty creation we humans call Earth. We’d like to close out the year with this thought: Work hard for your dreams, never give up, otherwise there’ll be regrets. That’s always been our way and so believe us when we say, fulfilling your dreams is worth all the effort. 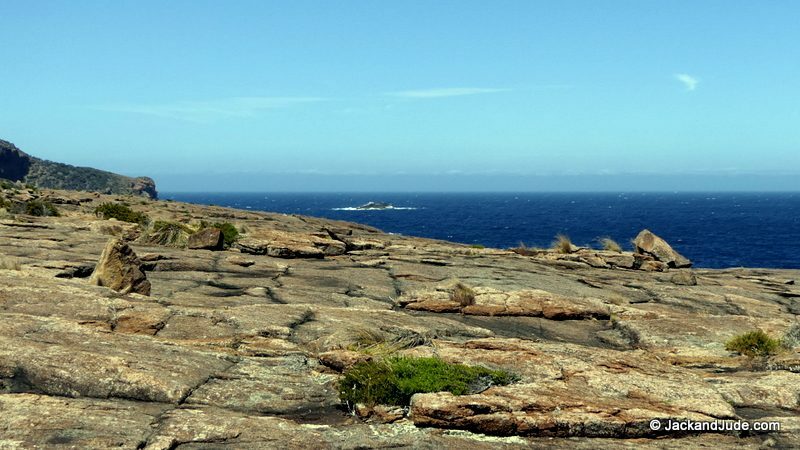 Jack and Jude are hiding out in one of Australia’s best kept secrets, a place few know and one that’s rarely mentioned in our schools even though it’s one of the most important islands in Australian history. Yes, it’s a mysterious location and we are hiding in it, surrounded by beauty in grand proportions in one of Nature’s strongest realms. Hiding not from the law or the masses, but hunkered down against blasts of fury straight out of Bass Strait. And you know they’re not called the Roaring Forties without good reason. Leaving Macquarie Harbour on the west coast of Tasmania, we voyaged overnight to King Island, where we enjoyed nine lovely days celebrating Christmas with friends. We then day-sailed quickly south-east to Three Hummocks Island, which lies near the northwest tip of Tasmania, where we crawled early into bed for a much needed rest before hoisting sail again next day to tackle the length of Bass Strait in one marathon overnight run that brought in the New Year. 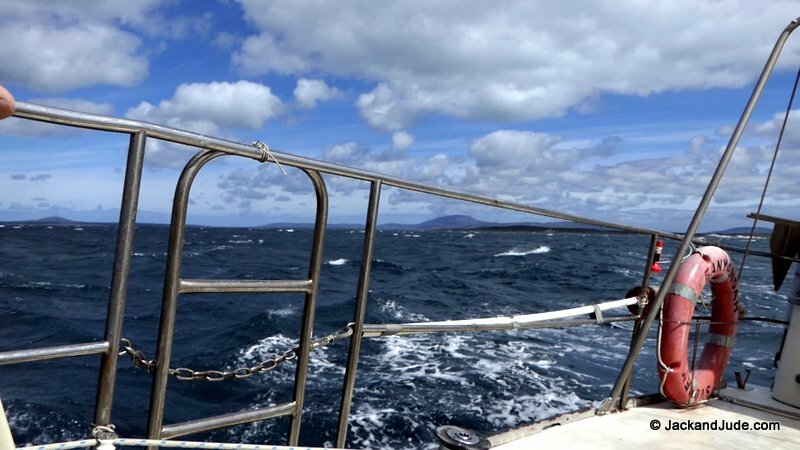 En-route, strengthening westerly winds served up sloppy seas, nevertheless we navigated safely to a rarely visited area of Banks Strait that is plagued by fast running currents and many hard to see obstacles. Anchoring close to shore at Hamilton Roads on Preservation Island, we hoped to evade the worst of the current and strong weather. There we bobbed and swayed for a couple of days while that weather system did its thing. When at last the high-pressure cell had moved directly over us, it brought sunny calm seas of the loveliest cobalt blue that was as transparent as the finest plate glass. 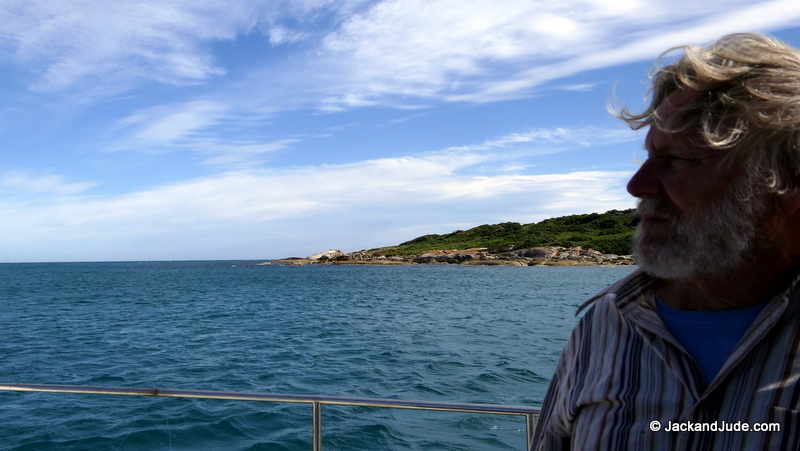 Excited with anticipation we moved our ship around to what had been the weather beaten coast, now flat calm like the smoothest satin sheets, and happily anchored within rowing distance to what is one of the most impressive bits of real estate in all of Australia. But when it was good, it was spectacular. 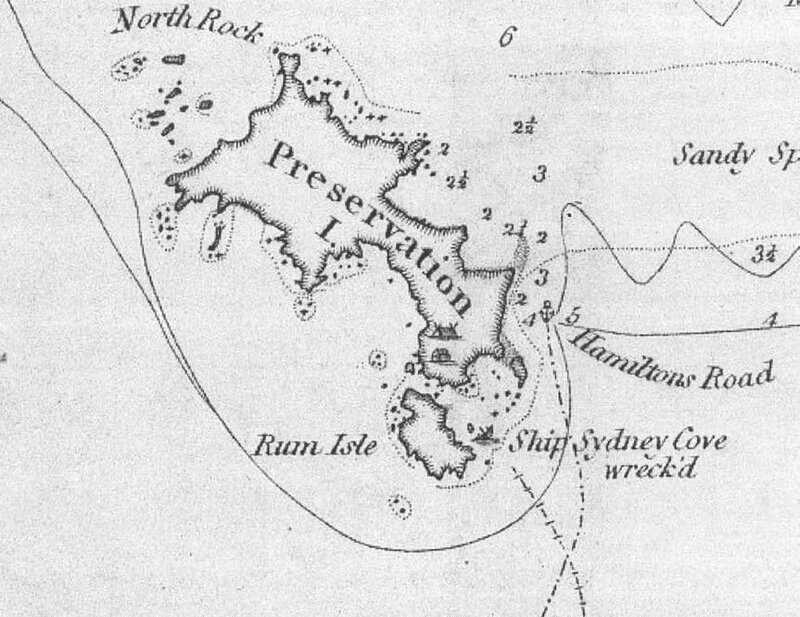 Sitting closely next to slender Preservation Island like a child next to its mother is an island some may have heard of, because it was named Rum Island by the rescuers of the crew of the Sydney Cove. 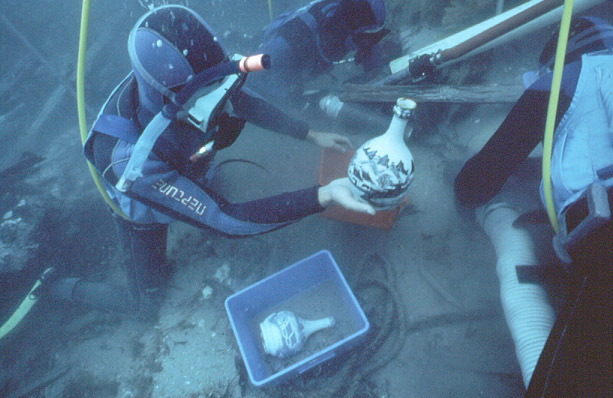 It was on Rum Island that the ship’s captain Guy Hamilton had ordered the salvaged barrels of rum be put for safekeeping, well away from his despondent and desperate crew. 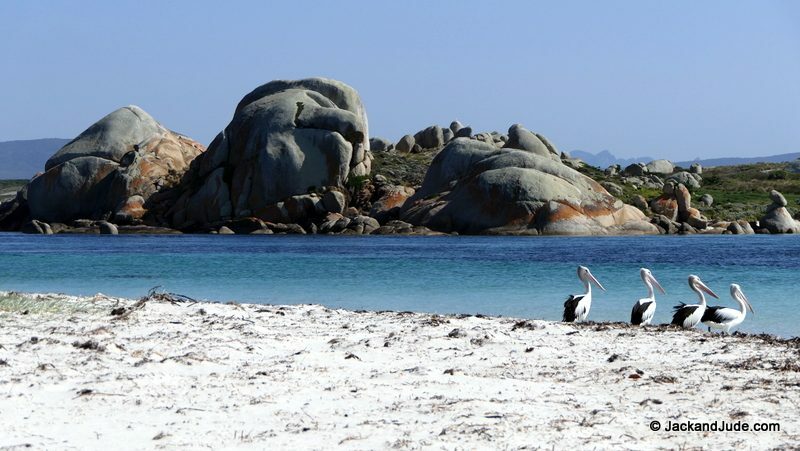 Like Preservation Island, it’s also dotted with towering granite tors splashed with orange lichen, and it has the most magical, fantasy backdrop of variegated greens dotted here and there with pockets of the purest vanilla sand. 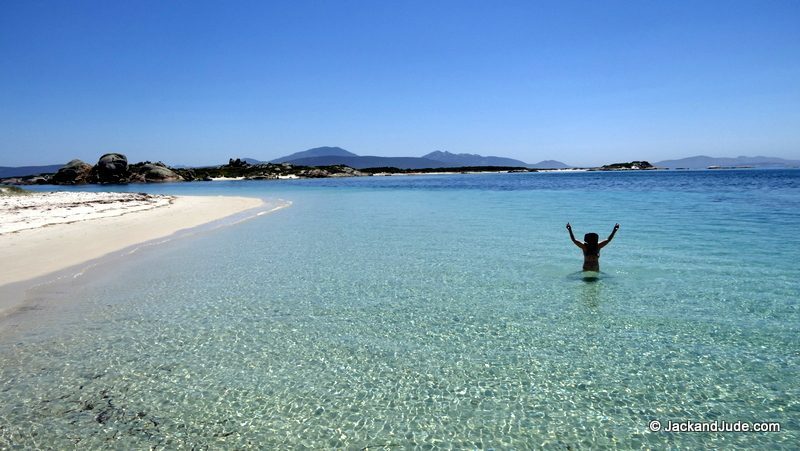 When we mention that these islands are located in The Furneaux Group, people ask, “Where’s that?” Answering them, we say it’s in resort country without a resort, with Preservation Island the piece de résistance. 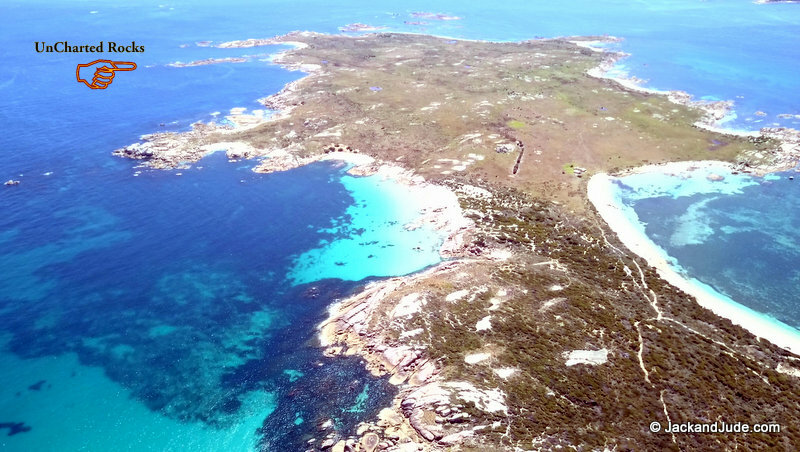 You may find this hard to believe, but we believe it’s one of the most important islands in Australia, and yet, it hardly rates a mention in our schools. Why? Well, if you watch our film “Summer 16” you will learn a lot more about this very important moment in Australian history. 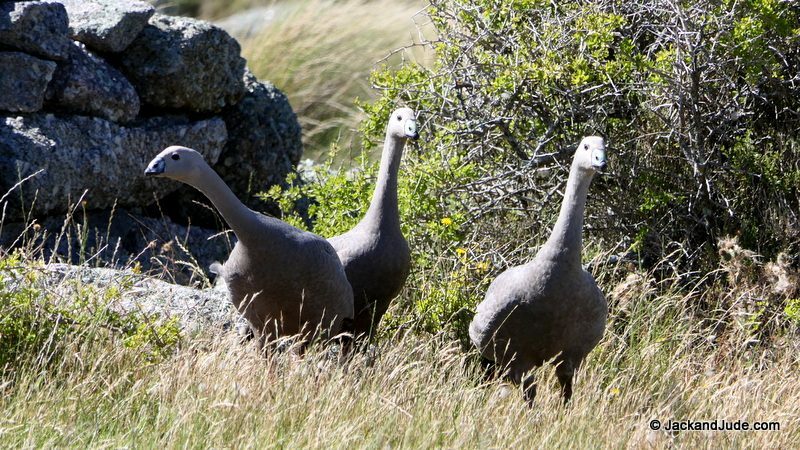 Jude was beside herself with joy at seeing her old friends again, the mighty granite tors and majestic Cape Barren Geese made a powerful potion that revived fond memories of our filming her re-telling the heroic story of fifty-two stranded men. No tracks, no trails, no trees, just open landscape with inspiring sea views in all directions brought Nature’s sounds to our ears. 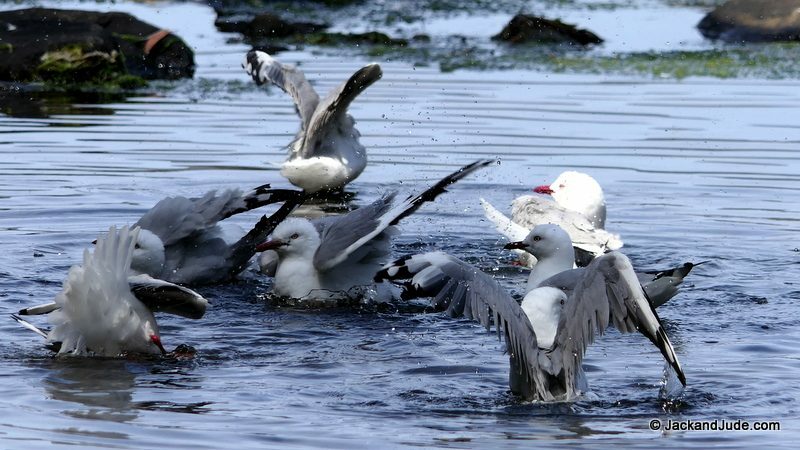 Large glossy white Pacific Gulls sharply called with beaks coloured as if dipped in red ink, in quite remarkable contrast to the grey geese that always pair for life communicating in honks, one bass the other alto. Our second day ended abruptly while exploring Rum Island, when rolls of thick fog seen approaching out the west forced us back to Banyandah to retreat back to the east side of the island. (see uncharted rocks) Where once again we found our 2016 anchorage in Horseshoe Bay, and endured more days of scudding grey clouds and high-pitched westerly winds. Which explains why this is resort country without a resort. Not that long ago when Australia was a mere infant nation, when famished colonists and convicts wondered when their next meal might arrive from across the seas, a tiny wisp of a sailing ship, renamed the Sydney Cove in honour of the fledgling colony, set out from India of all places. Loaded with much needed sustenance as well as many barrels of good rum, this somewhat frail craft that had been a coastal trader until called upon to deliver this precious cargo, ran into trouble crossing the very same Roaring Forties that are presently battering us. There’s not enough space here to fully recount this story that ended in tragedy. 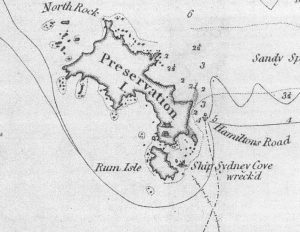 Only sufficient to mention that white man’s very first overland trek on Australian soil was undertaken by members of that ship seeking salvation and the rescue of their shipmates. 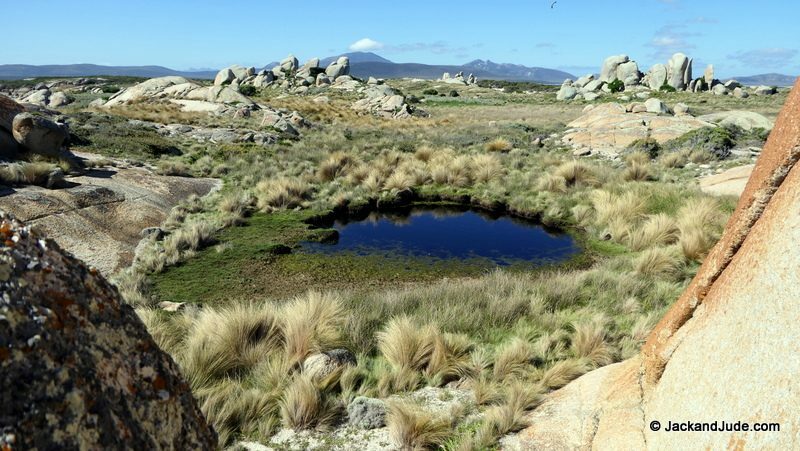 How those hearty brave souls survived two months in a hostile land finding food and water along the way will fill your hearts with wonder and admiration. It did ours. Jack and Jude were so moved that we made the film Summer 16 to highlight their achievements and showcase the impressive setting of their shipwreck and survival. 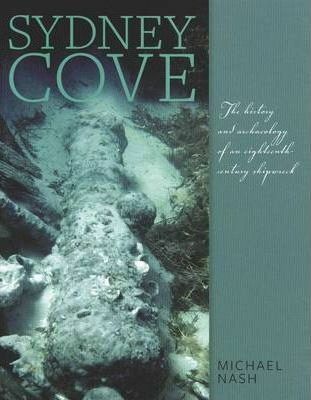 For those wishing to read more of this amazing and important event in Australian History, Michael Nash, the maritime archaeologist who directed the excavation of the Sydney Cove, has produced a comprehensive account, which includes maps, photographs, and rare pictures of one of Australia’s most significant shipwrecks that we highly recommend. Our thanks to Michael for his kind permission to use some of this material in the making of our film Summer 16. 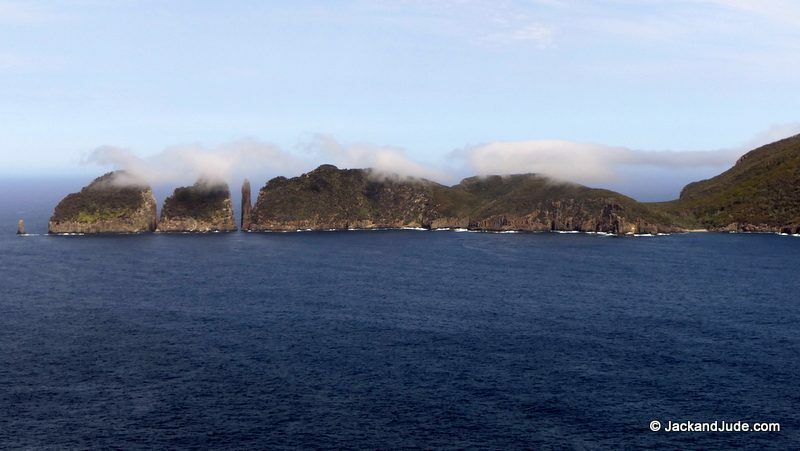 What all sailors dread – Fog and uncharted rocks. 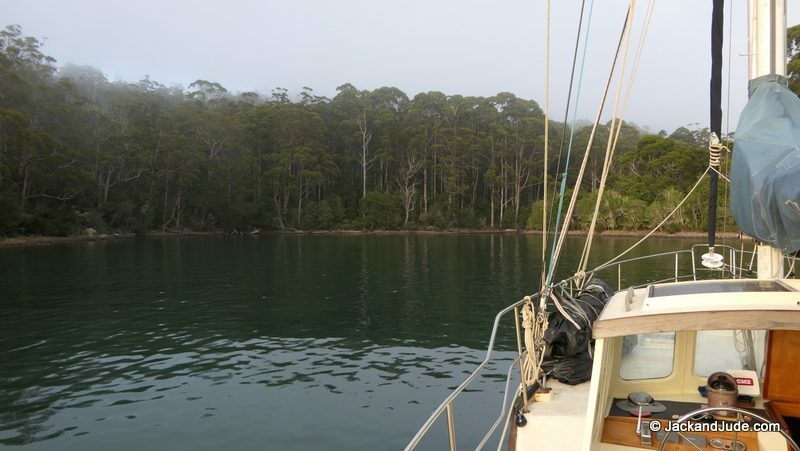 All our second morning anchored in West Bay, we explored Rum Island while a bank of fog sat low on the far distant west horizon, and when it began drifting closer, we packed away our toys and boarded Banyandah for a run back around the island. 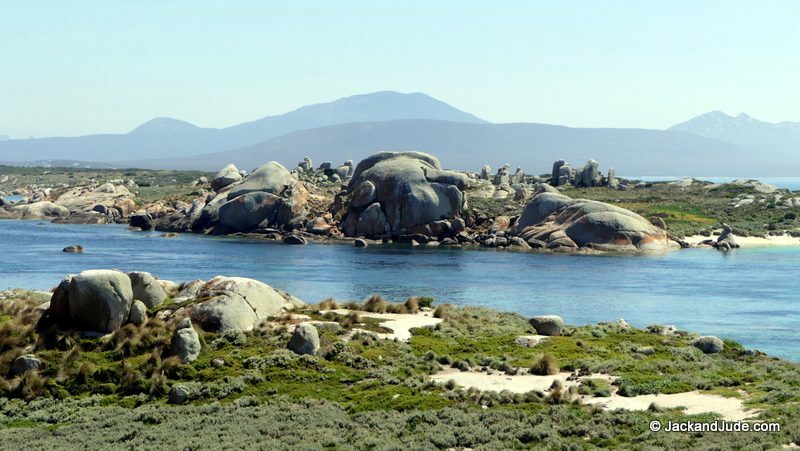 We have visited this area a number of times and know its shores are encumbered with off lying rocks, so we are cautious. Not very long after lifting our hook and clearing the first point going north, which has some above water rocks jutting out from it, the fog closed in surprisingly quick. In no time at all, vision past the bow of our ship was diminished. 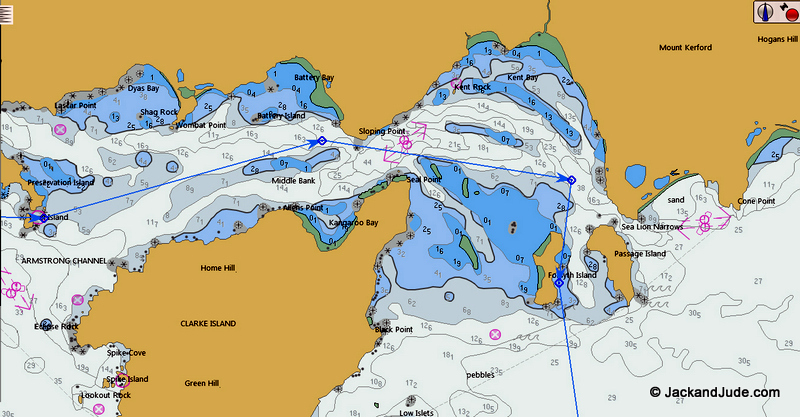 Jack was at the helm and made a turn to be well clear of the farthest rocks shown on our GME chart plotter. At the time, we were in 15 to 18 metres depth under keel and well outside the danger line. Reducing speed, both of us peered forward, talking glibly about the change of weather, when all of sudden Jude yelled, “turn hard left NOW.” And as I did so, this huge granite boulder came out the thickness. At the same moment the sounder started to plummet and my heart began to race. Instinctively I made a waypoint. Minutes later, the water deepened and the drama ended. Twenty minutes after that, the fog passed, leaving us with the question of “What the?” Looking back, there was a whole string of big rocks extending out from Preservation where nothing was shown on either of our plotters. Both use C-maps cards issued 2012 and 2005. We’d anchored bottom of image in that sand patch, had cleared the last rock off the first point when the fog came in. 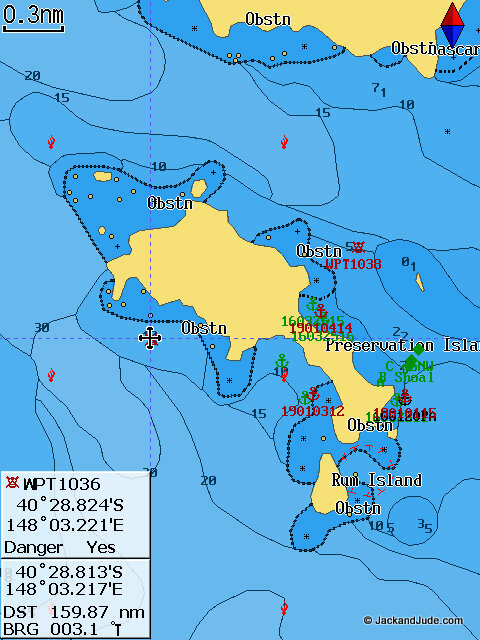 We have notified the Australian Hydrographic Office and wait to hear if Australian paper charts show these dangers. Understand, we are not trying make a case against the chart makers – We are doing our job of passing on local knowledge as sailors have since the beginning of time. Over the years, as explorers and adventurers, we have on occasion been in dangerous waters where it is paramount to be diligent, maintain a careful watch, and remember that you are on your own. 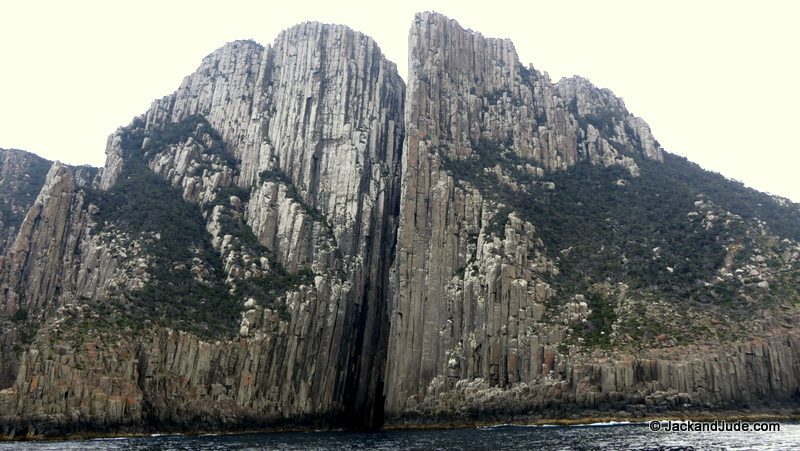 In 1798, Matthew Flinders did a crackerjack job of charting these rocks. Why aren’t that they on today’s charts? 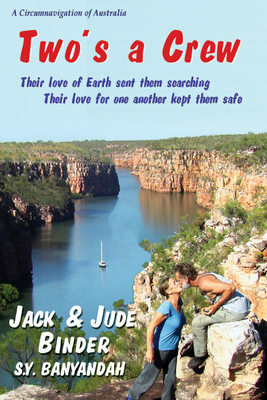 The beauty of the creation Earth always inspires Jack and Jude with its perfection because everything seems to work seamlessly without command – that is until we come across mankind’s effect. Humans are dirty creatures, spreading their waste without regard for Earth or her creatures. Jack and Jude see human waste wherever we go, often in abundance. Even when far out into the oceans, or trekking isolated lands. That saddens us and makes us angry. Are we such uncaring beasts taking what we can with so little pride in who we are? Rum and Preservation Islands are just two prime examples. 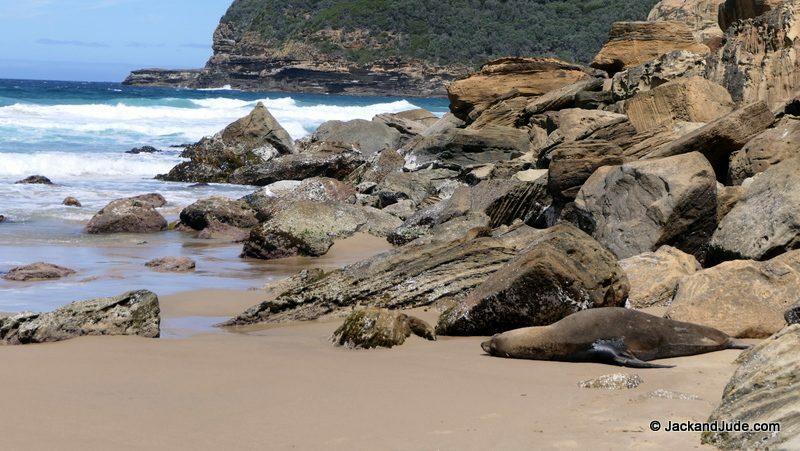 Their pristine unaltered shores are fringed with our trash. Lengths of plastic rope, glass bottles, plastic containers and much more were easily seen amongst the seaweed and cuttlefish backbones and dead critters that nature absorbs. Nature’s waste is fine. It’s been building the natural world since creation, but our waste, which is also absorbed after it breaks down, is changing and destroying Earth. USC Board professor and leading expert on economics and the environment. The natural world provides everything we depend on. We get our food from the natural world, we get our drinking water and our oxygen from the natural world, and we evolve as part of it. We simply cannot live without it. 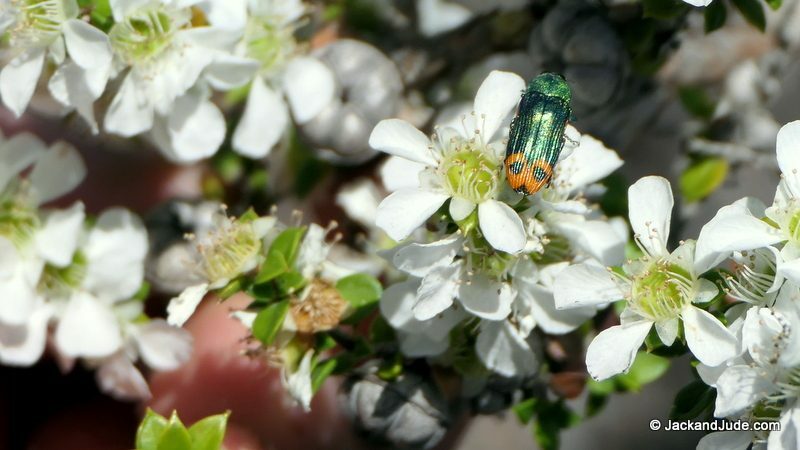 Plants create food, and they need pollination from insects, and they need rain and they need soil. We cannot synthesize these things. So we really are totally dependent on the natural world in the end. The strange thing is, people don’t acknowledge that anymore. We don’t see much nature. 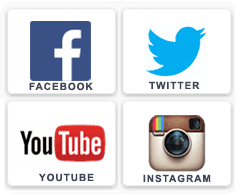 We are very embedded in our latest technologies, such as computer networks and our cell phones. There’s a sense that we do not depend on the natural world anymore. But that’s actually not true: we need it as much as our ancestors did and for the same reasons – to survive. 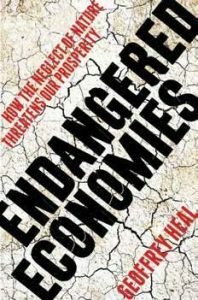 Jack and Jude see wisdom in what Professor Heal says in the review of his book Endangered Economics, but we also think world over-population escalates our dilemma. Why is this not discussed a whole lot more? Young ones, don’t wait for our entrenched leaders. 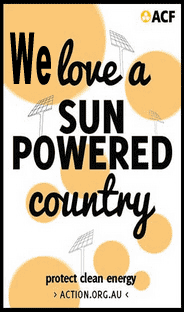 Too many are old school focusing on jobs and growth and little else except continued burning of fossil fuels. It’s you who’ll be managing Earth in no time at all and can save the planet and humanity, and you can have fun doing it. Get serious right now. Prepare yourself by learning all you can about the planet’s ecosystem and human’s effect. At the same time, get outdoors to be amazed by Nature. Organise the wise ones to take you out into the wilderness to teach you all they know about the forests and seas and other creatures, and how they interact with Earth’s ecosystem. And please stop listening to those telling you that exploiting the universe will find riches. We have plenty of riches right here on Earth. 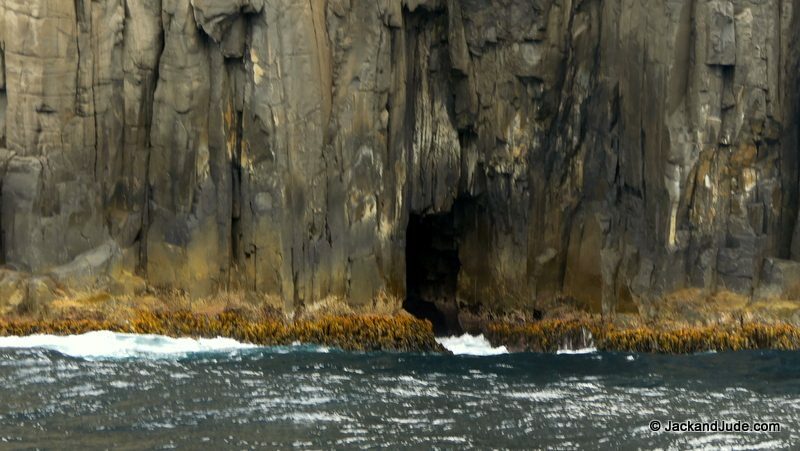 The westerly winds had blown strongly for days creating steep dangerous seas in the narrow passage leading out Armstrong Passage into Banks Strait. 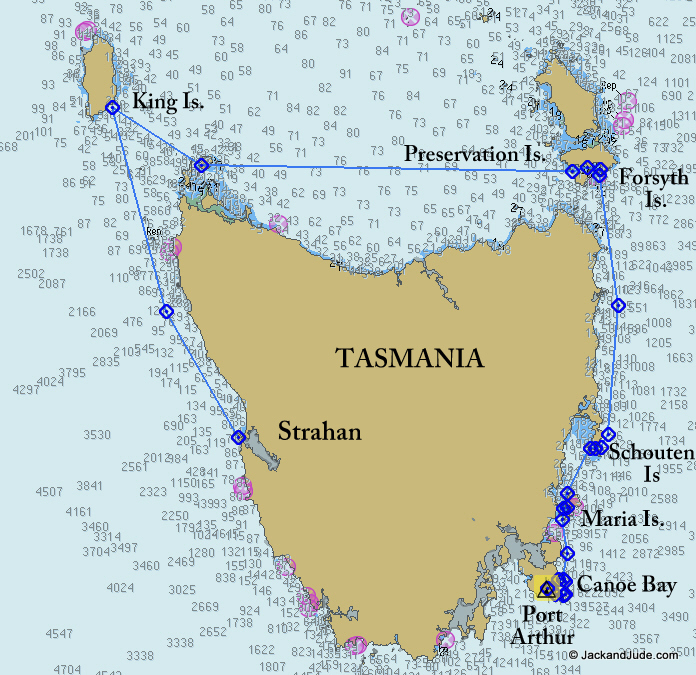 And that created a dilemma for us wanting to passage many miles down Tasmania’s east coast. 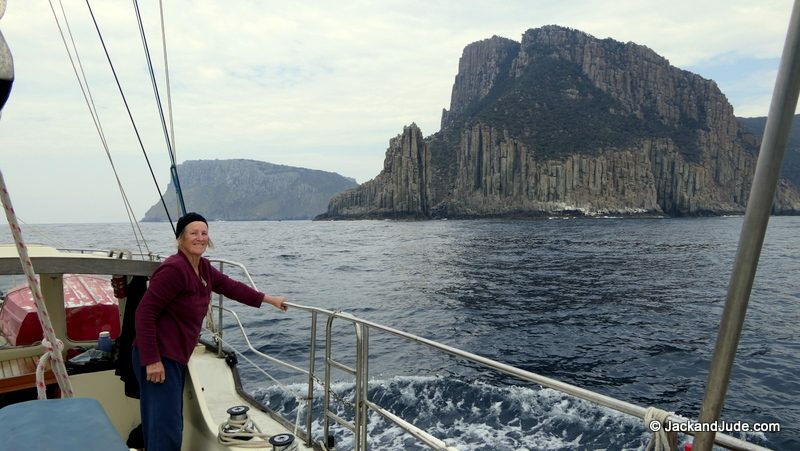 As there are no all-weather anchorages on that stretch of rugged coast we didn’t intend stopping before reaching Schouten Passage at the southern end of the Freycinet Peninsula; and if we still had fair winds and felt full of vigour after a night at sea we might sail further on than those 120 nautical miles. But, getting out and through Banks Strait was our problem, especially with the wind and tide out of sync for a timely departure. 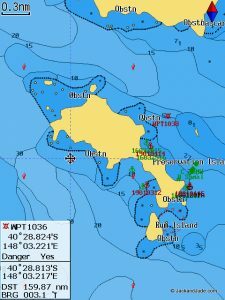 Therefore, we decided to mosey further east to a pair of islands lying just before the much-feared Sea Lion Passage. Strong currents run east and west through it, and those coupled with a sudden steeply rising bottom creates standing waves whenever strong winds blow as we’d found once before. The islands of Passage and Forsyth run parallel to each other in a north south direction and on the chart they looked perfect to block the westerly winds we were expecting. The question was whether they’d be safe from swell running up from the south. 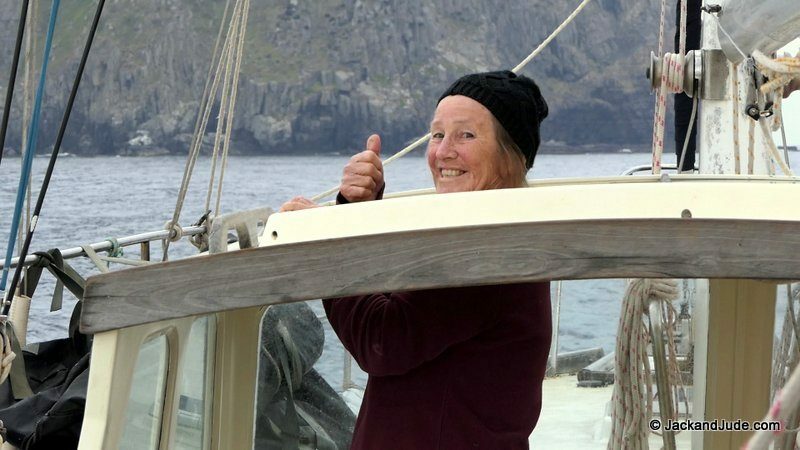 Anxious to find out before the new weather system brought the forecast strong to gale force winds, we sailed deeper into Armstrong Passage, propelled by a poled out headsail, and aided by the ebb tide flowing in our direction. 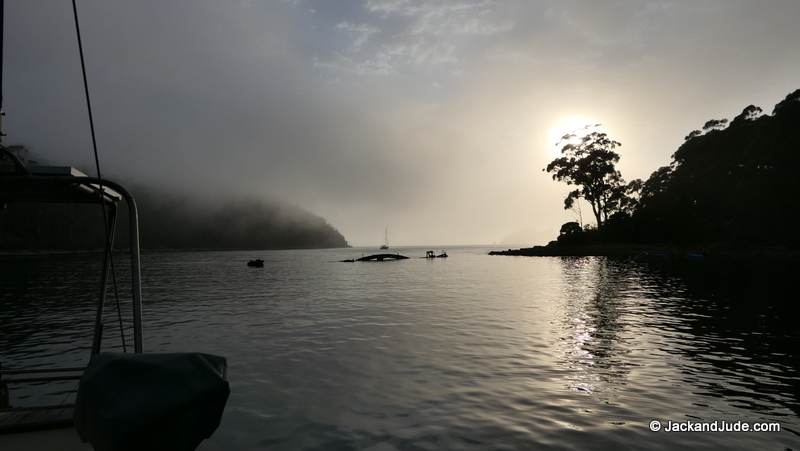 On the south side of the passage, the largish Clarke Island offered sanctuary in Kangaroo Bay that held bad memories of sheltering there one windy night and dragging anchors, all three of them, and none finding a grip in the soft slimy weed. That clinched our decision to go onward to a new location. Our first sight of the twin islands impressed us. Both had forested spines running across the wind instead of flat contours like Preservation Island. 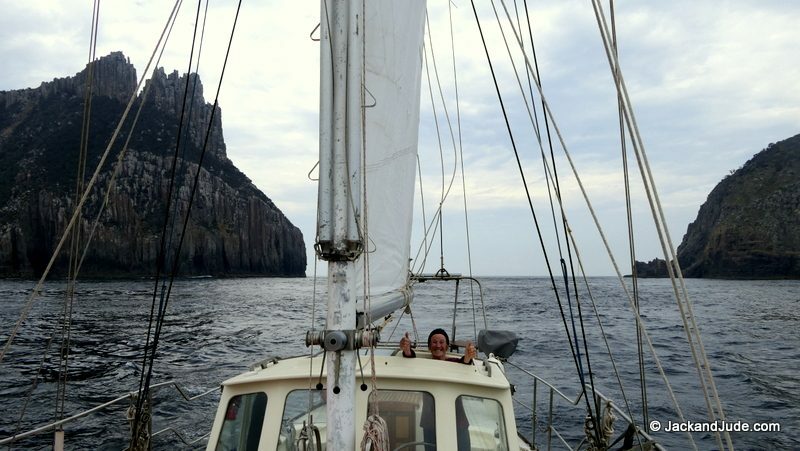 With hope fueling us, we cranked in the headsail, sending Banyandah skirting around the immense shoals spanning the gap between Clarke and these islands. 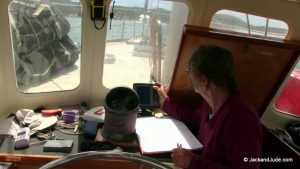 Fishermen tell us there’s a way through its many miles of shallows, but we’ve not looked, nor would we consider doing so in the fast worsening conditions. 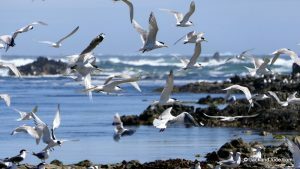 Upon sighting white breakers frosting the northern entrance to the channel, a first hint of doubt entered our thoughts, even as those beautiful creations brought a smile to our lips with their power and grace rushing in from the sparkling turquoise sea. It was a rather tense smile wondering what lay ahead, wondering whether we’d be trapped in an untenable location, and be forced to sail on into the rising sea near the edge of Banks Strait. Discovery II, our sail mates and friends for several years, were ahead seeking the same shelter, and it was with quickening hearts that we heard their report on the VHF of steep breaking seas at the cove of our choice. Disturbing news that we took in our stride then carried on with our normal routine. 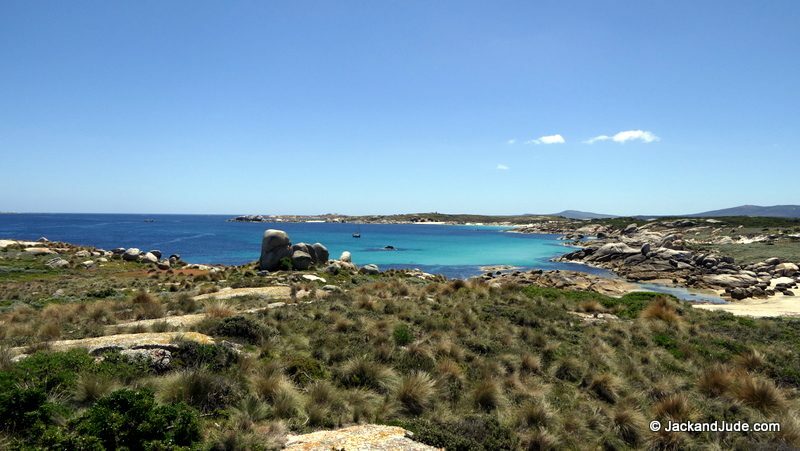 Now within the beautiful setting of twin Islands about a mile and a half in length separated by approximately a mile of sea turned Prussian blue by passing cloud, we could see a wide fringe of shallow sand suddenly rising. And that was not what we wanted, not with the constant swell running up from the south. Our thoughts were then broken by another report from Discovery II, this one more encouraging. 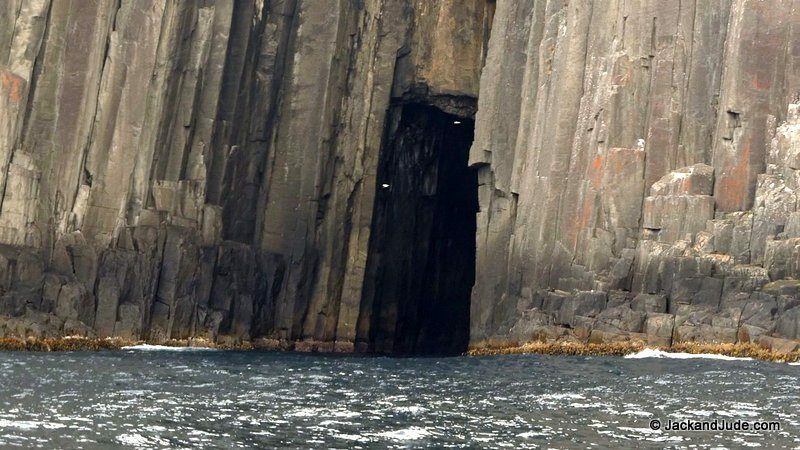 It seems they’d found a passage through shallows to a seven metre deep hole close to shore that was protected from the dangerous swell. Neither elated nor surprised upon hearing this good news as we were taught years ago to take what comes because Nature dictates terms within its realm. Sometimes all is super fine, sometimes it’s gruesome, sometimes it’s so quiet and calm like floating upon silken clouds, other times so powerfully rough we fear for our ship and whisper the mantra “and this too shall pass” in order to stay sane and composed. Ahead Discovery II could be seen anchored and gently swaying in the passing sea. In front of them lay dramatic bold rock separated by twin beaches with the sea awash up their steep approach. To this Banyandah was directed, through waters so shallow they rose and peaked until reaching the darker depths. 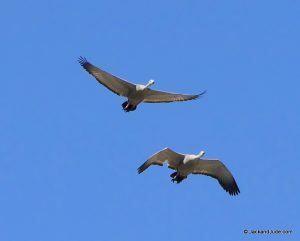 Behind us those rising crests continued rushing forth till forming crests that broke in cascading white that had plumes of spray flying back from whence they came. Only a trifling motion radiated towards our vessels, and so we made a circuitous route to explore what would be our home through dark and windy nights. Twice we stopped our ship to sample water motion and imagine our escape route. There was no haste. 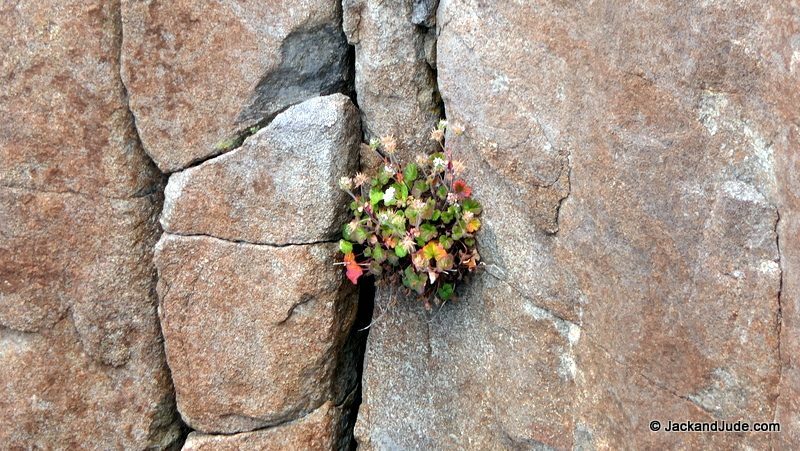 Once down, the anchor would need to safely hold us through whatever Nature had in store. Boulders adorn the shore, breaking surf behind. 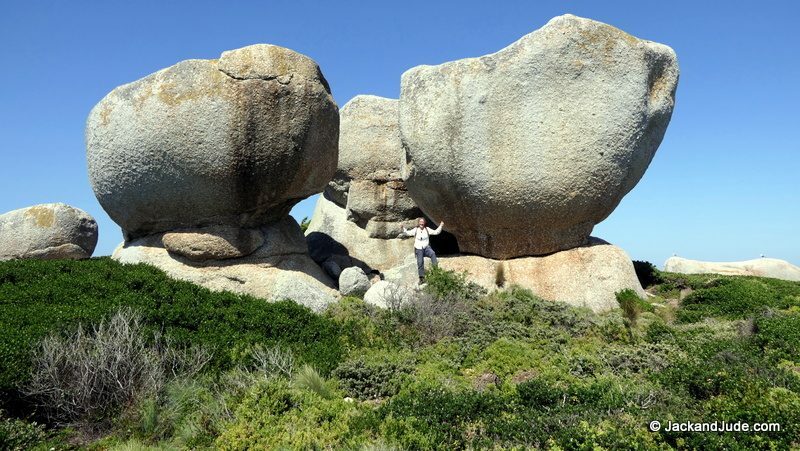 Our chosen spot was close to the larger boulders in the most southern corner, affording us the best protection from the forecast winds and where we thought ran the quietest sea. And once anchored and our ship tidied up, we sat together upon our stern locker witnessing the wonders of this new location. Through the translucent waters we beheld a sand bottom of the highest purity and knew our BOSS anchor would be buried deeply with all our 70 metres of chain laid out. We’d not be dragging from this location. Orange lichen decorated the larger polished boulders and stood proudly out against the dappled greens of scrubs and medium height trees. Together with the large tracts of manila sand, the scene seemed to come straight from a South Pacific tale, except the cold blasts brought gravity to our situation. 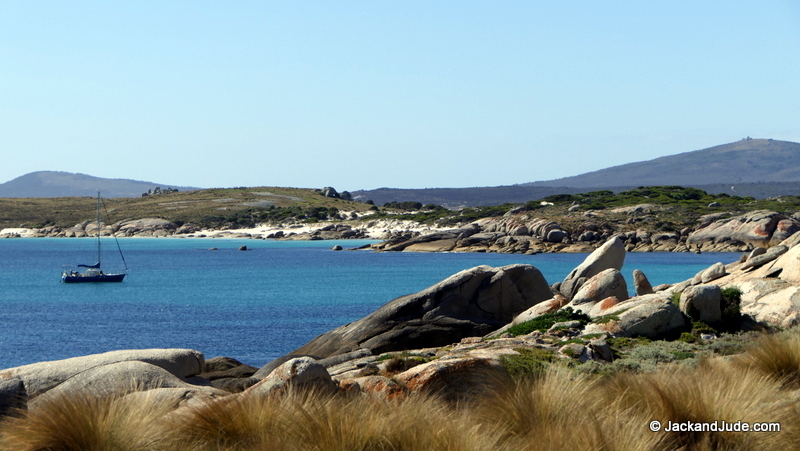 To north, Mount Kerford on Cape Barren Island filled our view. 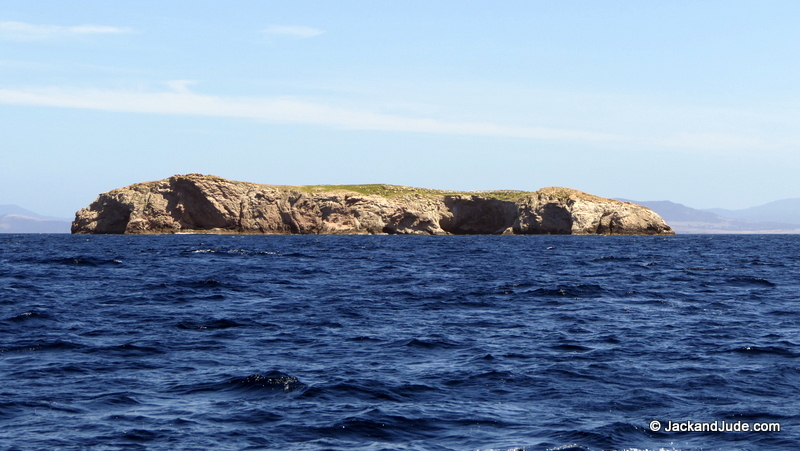 The low green Passage Island on right. As darkness descended, a slip of blushing moon low in the west amongst a black heaven lit by twinkling starlight brought our new foe of wind. Its blasts, like those of Mohammed Ali, soft like a butterfly before a sting of great impact, caused our ship to groan, straining against her springer. All that long first night we lay listening to its cacophony of might do battle with our ship while every now and then, especially after a great blast, we’d check our station on the chart-plotter. What easy bliss compared to days of old when our only guard was a flashing neon showing depth. On and off we both slept well until the last hour before dawn when the sea’s motion increased alarmingly. Had the tide changed direction was our thought lying there in light slumber? Whatever caused the change, upon rising, steep seas rushed past just behind us. And our friends on Discovery II were gone. On channel 77 we made a call and after many seconds of silence filled with concern, to our relief we heard a faint reply. The motion had alarmed them into moving onto an anchorage on Cape Barren Island lying to our north. Checking our position verified that we’d not shifted even a smidgen. As our next destination lay south of us and that we’d tolerated much worse motion in our time, after observing the mighty surf for a while, we decided to hang there and hope whatever had caused the seas to stiffen would pass. And so it did. By noon we were back to an easy motion, with the wind taking a much deserved break. But that was not destined to last. As darkness crept in upon us, the beast returned. However, once bitten, we were prepared for its might. Jack shifted forward to sleep on the sole next to the mast, and Jude, well, she can sleep standing up, so we both slept soundly through the night. Next morning, most of it had abated, leaving behind a most perfect sailing breeze. So, after a fast breakfast and quick check over our vessel, we set sail for points south, wondering how the seas would be. In the brilliant sunshine of the new high pressure system we raised our main double reefed and let fly 70% of the furler. Heeling to the power of cold wind, Banyandah charged out from the confines of those two islands, out into the wide blue sea flecked white. With Jude wearing her best smile, tears of joy on her face, revelling in the power and might of conning her baby, I didn’t dare suggest we engage Sir Aries until she exhausted her lust for this. As the elixir from our glorious voyage down Tasmania’s east coast sorted out any doubts roaming round my head, the physical exertion had my body bristling with renewed muscular power, and with the coming dawn we knew that pushing on into strengthening winds to complete miles that could be sailed in days ahead would spoil the moment. 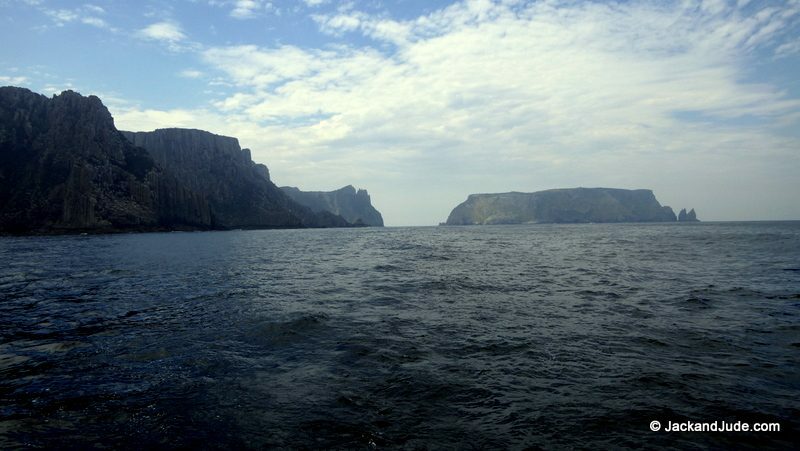 That decision saw us turn to sail straight through the spectacular rouge red and golden streaked ramparts of Schouten Passage, where immediately we caught a small Barracouta on our trailing lure. 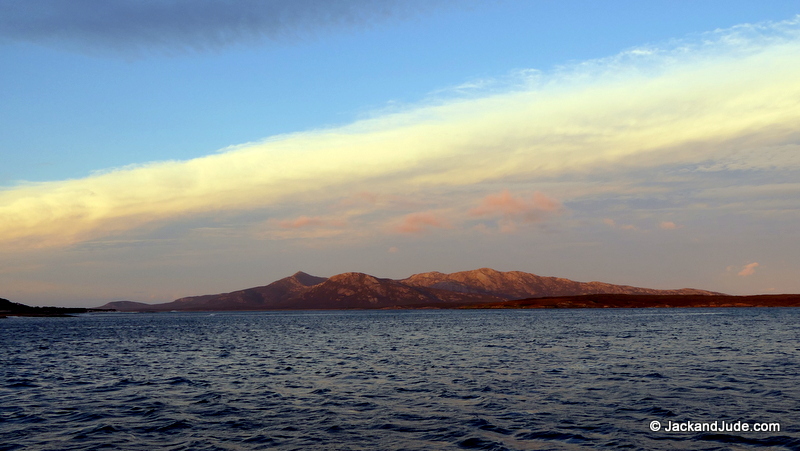 Having decided to shelter within the large bright-white smile of sand protected by the Freycinet Peninsula, we beat upwind across calm smooth waters, enjoying the fun of sailing in complete tranquillity. With her massive Panasonic FZ2500 beside her at the helm, Jude captured happy snaps and mega-pixels of video while coaxing our lady up into the lessening breeze towards the north and shallows. Seeing four or five others yachts along that stretch of uncluttered beach, to better protect our lady we picked a spot well away from them and plonked our hook down while still under sail, capping off a fantastic voyage. Almost immediately the aquamarine sea behind us ruffled darkly as wind willy-willies whooshed down the valleys, setting our BOSS anchor more deeply into the clean sand bottom. Turning to each other we smiled like kids hearing the school bell releasing us to play. Out the absolutely clear blue sky, as the wind bullets gained strength, first one vessel then another blew sideways before dragging away from shore. And so the drag-parade began. And while those demons gathered ferocity from the heat of a clear sky, more vessels gathered under Bryans Corner, and more found difficulty holding position. Around the corner in Promise Bay, where for many days we’d been enjoying the majestic purple granite peaks of the Hazards all by ourselves, then the weather changed. 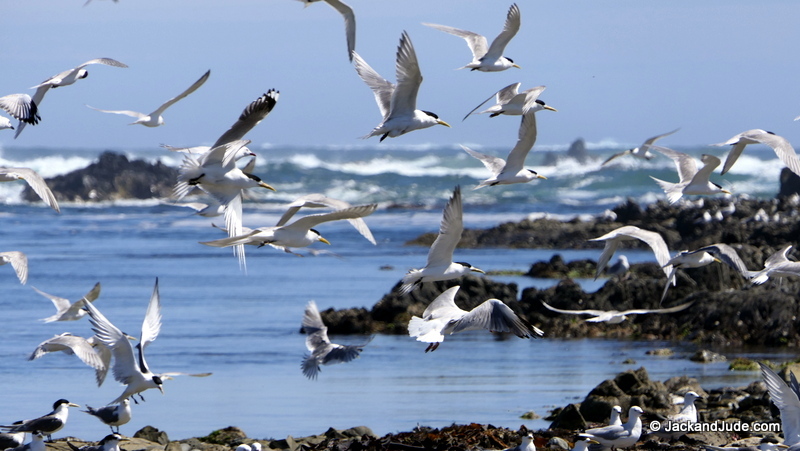 The bay wasn’t a worry because the wind gusts came straight over the nearby eastern sand bluffs. But our contentment was soon to end when a flotilla of vessels rounded the southern point and were seen laboriously powering towards us like a fox spying its prey. I suppose seeing a vessel anchored signals to most that it must be in the very best spot, because during the ensuing few hours we became surrounded by yachts like a wagon train surrounded by a band of Indians. Now it’s not that we’re antisocial. It’s more a matter of self-preservation as we’ve been put under threat by dragging craft many times in our travels around the world, so let’s just say we’re gun-shy. Anyways, against my menacing glare, this house sized catamaran placed himself directly in front of our beloved home on the water, and to-boot paid out little scope, ending up within spitting distance. Buffeted by gusts, I stood at our bow and shook my head and called out, to wit, the fellow ignored my pleas, turned about and went through his sliding glass doors, closed them then drew the curtains. Normally yachtie’s are first class folks. The best we say. They’ll come to your aid, pass info, loan you gear, and are upright citizens of Earth. But the odd one is not. Anyways, darkness was coming and I knew I’d not sleep a wink with that bus poised to run over us, so, with much grumbling we shifted. Geez, that beast was that close we almost went in through its back door when picking up our hook, which I might say, was nicely dug in. When free, we obviously moved well away from that lot, unfortunately further out into even bigger blasts, where we tried to get a new grip of the bottom. Well, our first attempt ended in failure as our bow fell away and off we went. Attempt number two also ended in failure bringing my inner core temperature to near boiling. Moving to a new spot we tried again, but, alas, a sudden gust saw us shear off and begin dragging little by little with each gust. When we’d slipped a quarter mile we hauled up the hook again, and this time pulled it right out the water, to find, much to our surprise that we’d speared a rather large oyster shell with the point of our 45lb CQR. That’s a lesson. Take a look. Once that was corrected, we got a good grip, and a beer later, calm returned to my inner self. But ever since then, we shy away from other craft when strong winds are expected. Behind Bryans Corner it blew big time all night and most of the crafts shifted, ending up in a tight bunch at the nook. We and another held well. Since changing anchors in 2013, our big Manson BOSS has not let us down, whereas, the CQR we used for many years was sometimes temperamental, especially in weed. Anyways, dawn found us becalmed just where we’d parked. 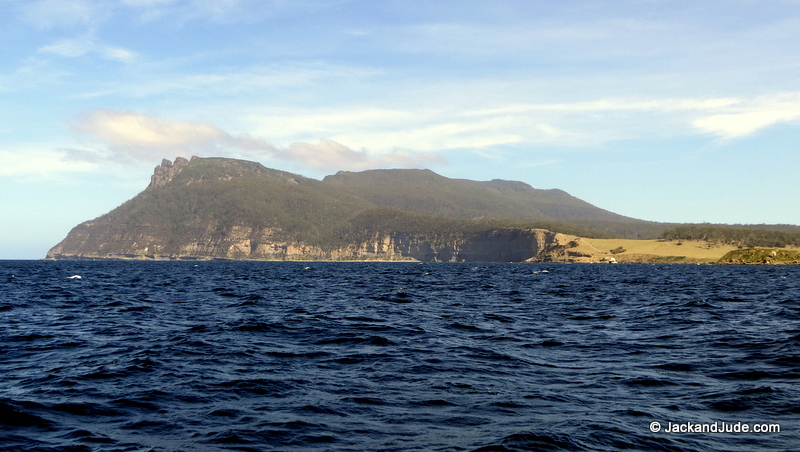 There’s a funny thing about this part of Tassie. 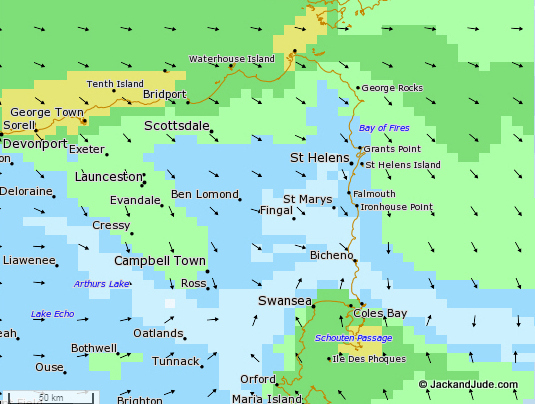 When the wind on the West Coast backs south of west, over on the Hobart side it generally runs up the coast and meets a northerly coming down from Bass Strait. And these two flows often meet around Schouten Passage. 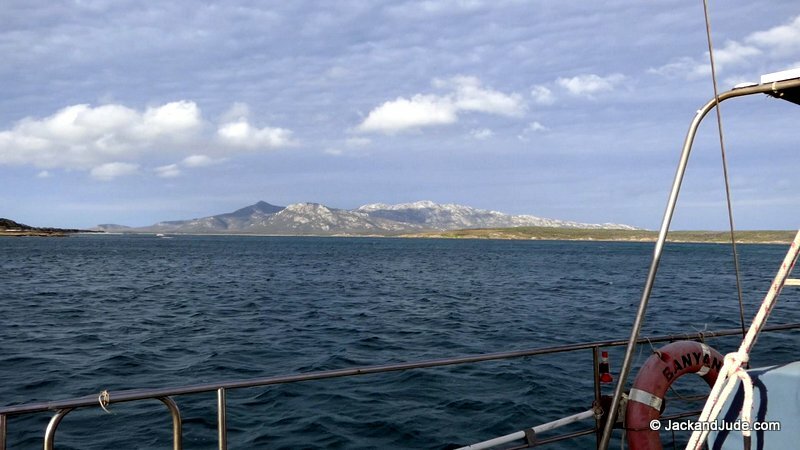 So, vessels sheltering from a northerly find the next day needing shelter from the south, creating what the locals call the Schouten Shuffle – moving the few miles from Bryans Corner on the Freycinet Peninsula to Schouten Island across the channel. Our second day, we did the Schouten Shuffle, parking in our normal spot off the Ranger’s house just inside of the weed. As the day progressed and the southerly winds became more established, more boats arrived. 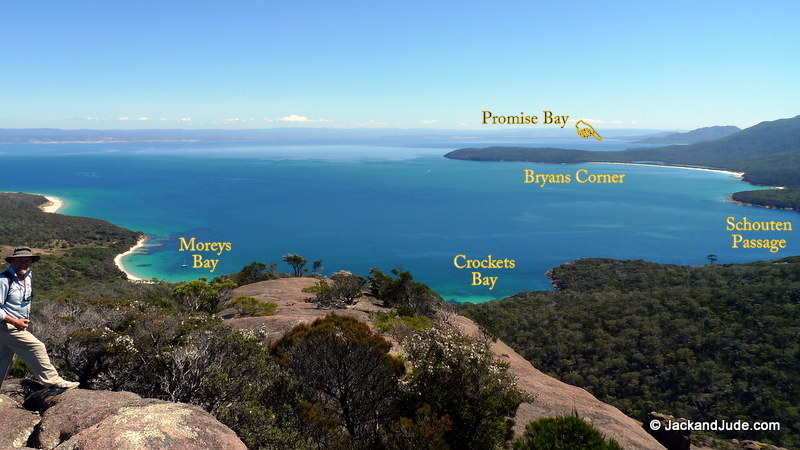 Most choose the more popular Crockets Bay, next to us in Moreys Bay. Over the years, we’ve been ashore many times and climbed Bear Mountain an equal number, and when we saw that the Ranger in residence wasn’t the one we knew, we stayed on board to read and write up our journals. Our last blog was created that day. As the weather was set to change back again the next day, we also rested for another hop instead of doing another Schouten Shuffle. North bluff on Maria Is. 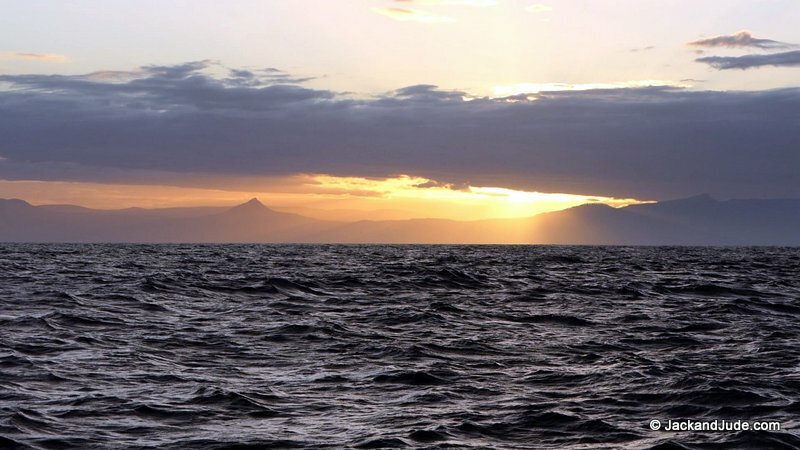 Next day, while the other vessels hopped back to Bryans Corner, we had a cruisy sail south past little flat topped Phoques Isle then onto Maria, the voyage getting better as the miles ticked past. 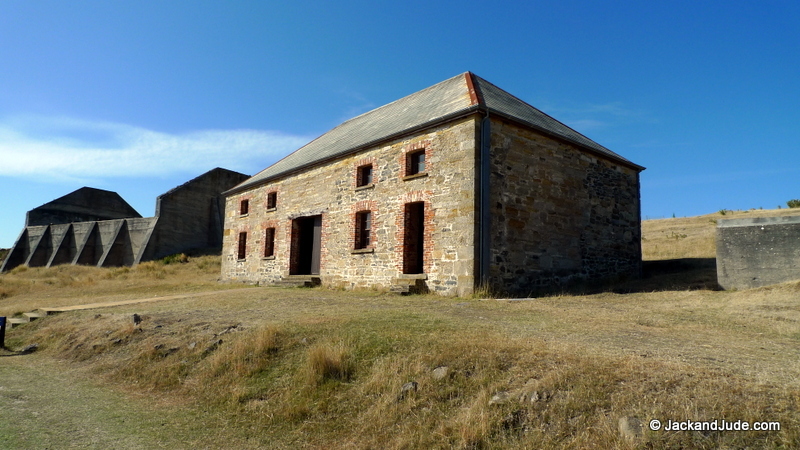 Towards the end, it was so sweet that we sped close along dramatic Maria Island with great views of the convict penal settlement at Darlington, in use during the mid-1800s with a number of buildings and structures surviving relatively intact that are now a tourist attraction. 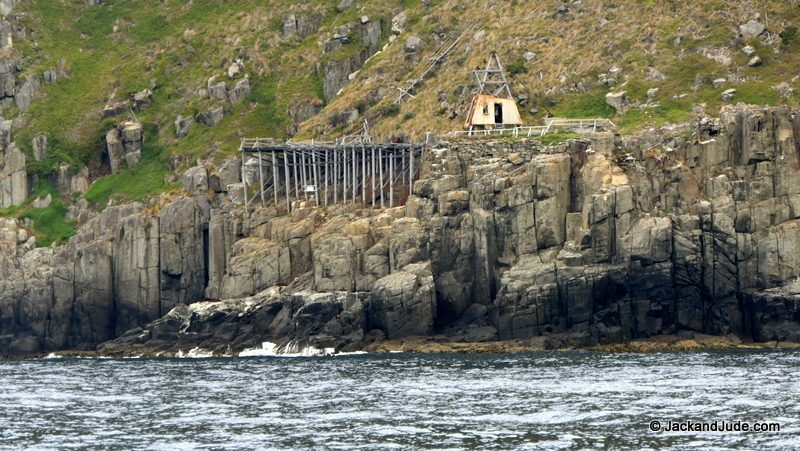 We ran wing n’ wing past these impressive stone buildings then continued through Mercury Passage towards Chinamen’s Bay, a large shallow inlet in the island’s southern part, where we nursed our lady into a sheltered nook just inside Point Lesueur and put our anchor down on the run. Here’s a five year old vid filmed on Maria with a GoPro3. 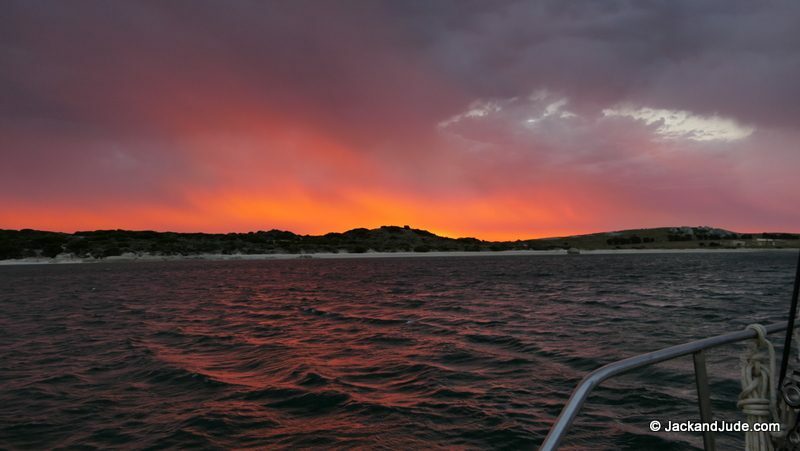 One night was all we enjoyed at Chinamen’s, catching enough flathead for a good feed, before hoisting our BOSS for a sail-away start to what became a golden sail to Fortescue Bay. Gosh, a perfect wind in just the right quarter had our lady scampering at maximum comfort speed. So fast, a pod of dolphins chased us to play at our bows, zooming past before turning about for another blast. Both of us filmed them and there’s a short vid online, Dolphins Having Fun. 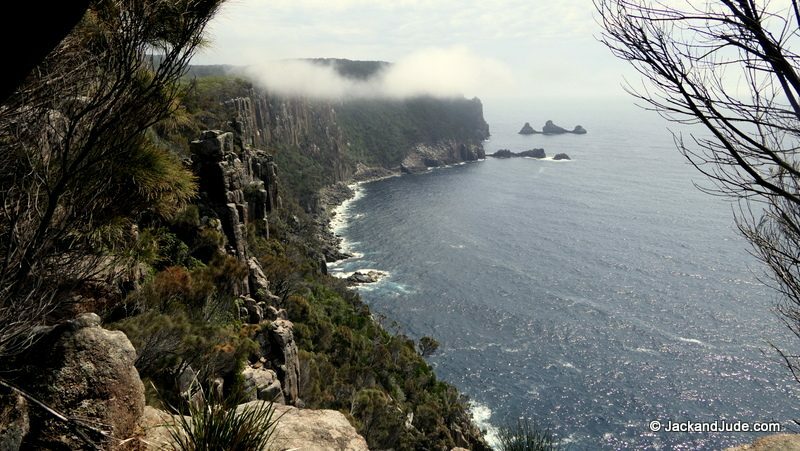 It should be noted that our voyage around Tasmania isn’t actually a cruise; we’re heading for a much-needed haul out, coupled with a quick visit to the Hobart Wooden Boat Festival before heading across the bottom to Port Davey and then home to Strahan. So we’re clocking up miles whenever the wind is favourable. Jude, the on board statistician, records miles by sail versus those assisted by diesel, and so far we have notched up some impressive distances under sail. 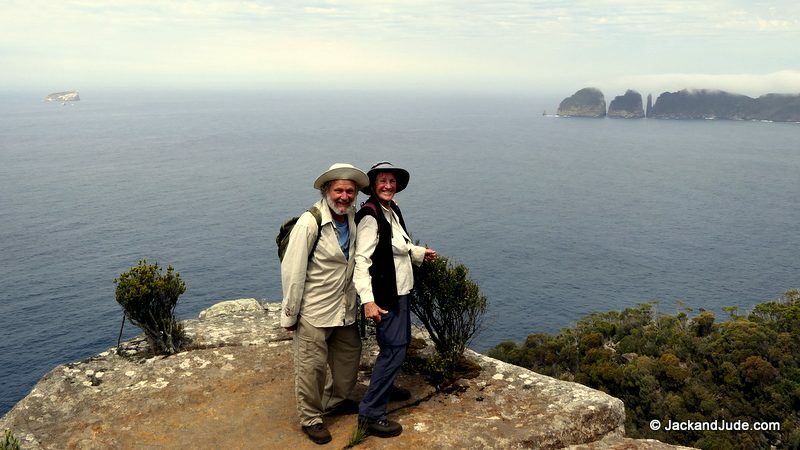 We had considered the option of going through the Denison Canal to Norfolk Bay, or around the Tasman Peninsula, which can see big seas, albeit with dramatic, impressive scenery. The forecast said we’d have a good run if we opted to sail around, whereas we’d be motoring a long way the other option, so you can understand our choice. Once entering the abrupt entrance into Fortescue that’s bounded by perpendicular cliffs, we found the tiny spot behind the wreck of the William Pitt in Canoe Bay vacant. How fantastic! That meant no annoying swell like what can be found further into the wider anchoring area. 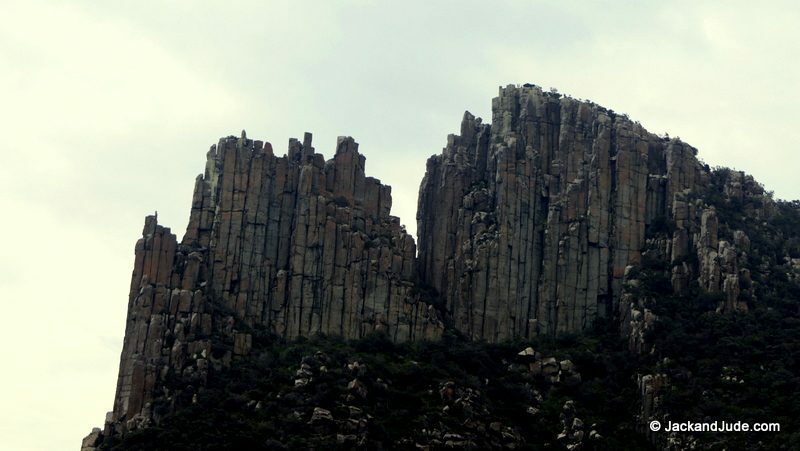 We slipped straight in to be immediately surrounded by tall gum forests, and could look out at the impressive Cape Hauy and Candlestick Dolerite column. 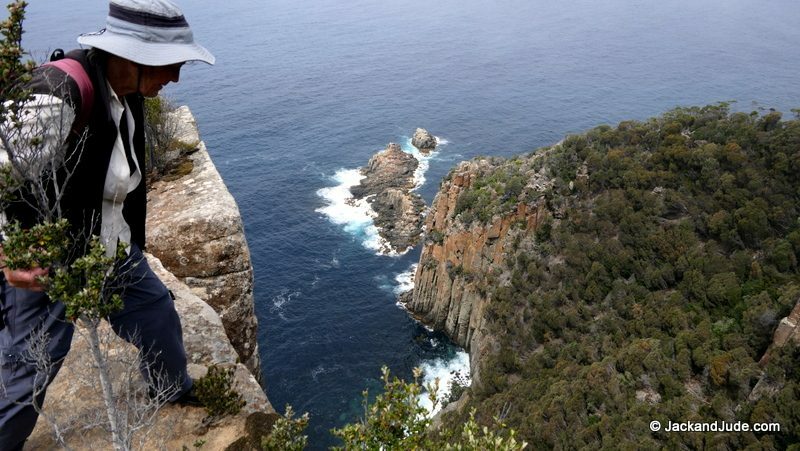 What was even better was the walking track not a stone’s throw away that took us to those massive vertical cliffs we came past. That was day two’s main activity. 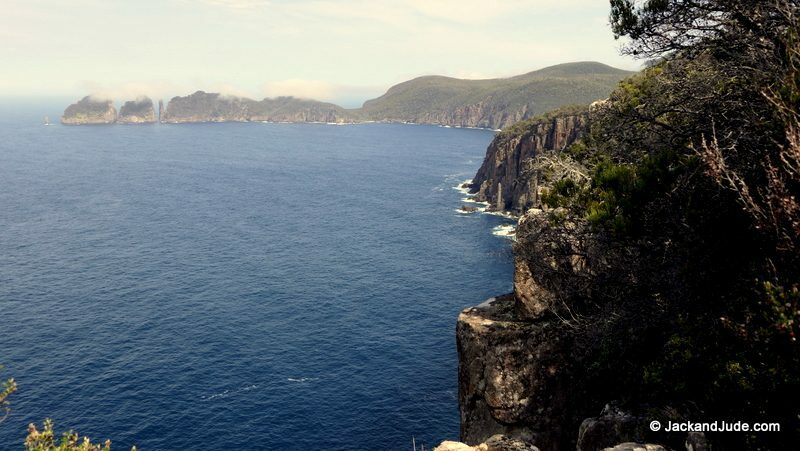 A walk through gorgeous tall forests, stressed a bit by the extended dry, then over the still flowing stream at Bivouac Bay, where you can bush-camp, before a heavy climb up to a frightening sheer drop-off overlooking eternity. Of course we just dawdled along at half throttle taking the whole day, but, gosh, we took lots of photos. 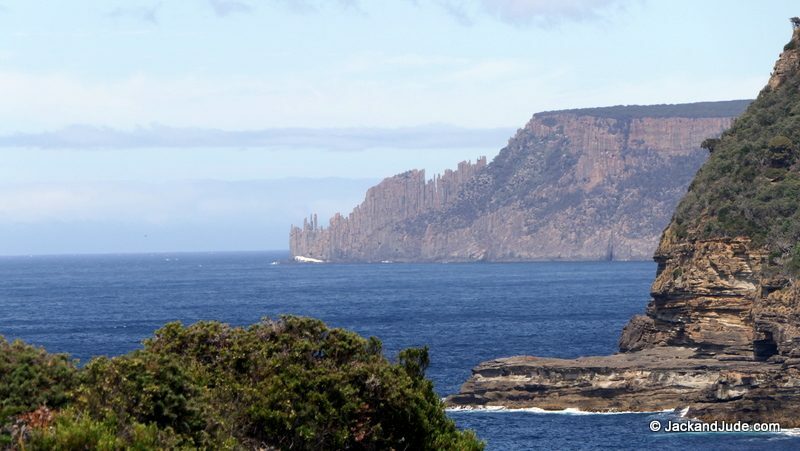 The following day’s forecast wind looked good for a run around to Port Arthur, but I guess someone forgot to tell Eurus, god of the unlucky east wind who must have taken a holiday. So we motored. 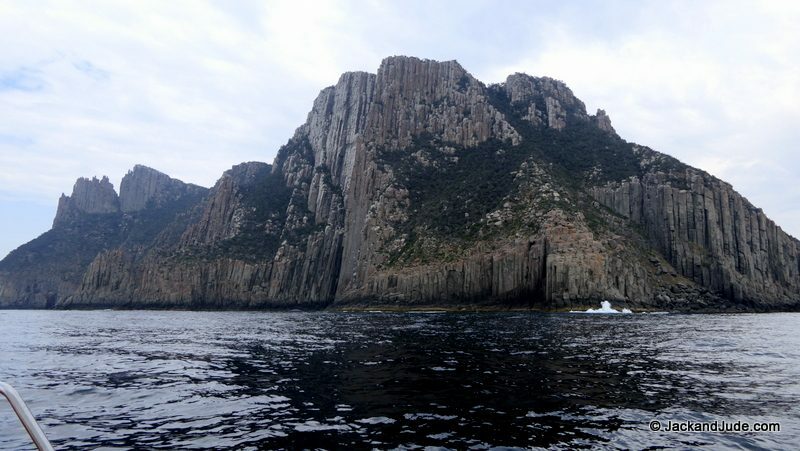 One fabulous outcome, we got to pass between the impressive Cape Pillar and massive sheer sided Tasman Island. Wow! What a treat. Firing off photos in every direction, some finding sea level caves of monumental proportions, we even found a friendly current going our way and sped through at an alarming rate. So there we were in Port Arthur, a place of notoriety for more than one reason. 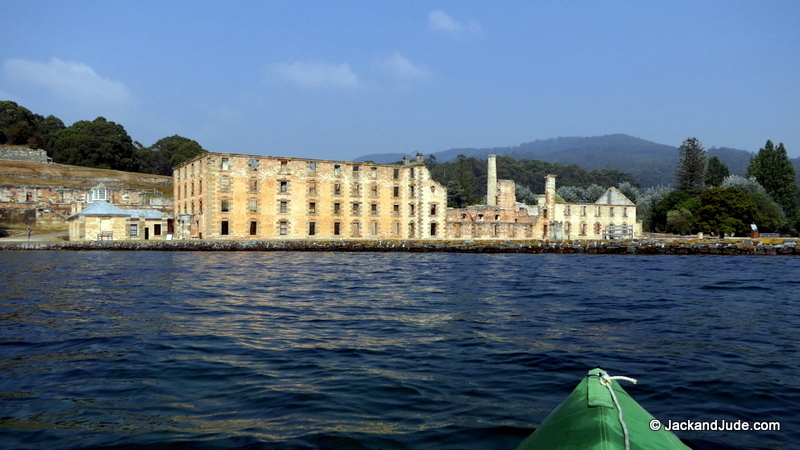 First, it was the penitentiary that replaced Sarah Island in 1832, housing the poor sods that had re-offended after being shipped down to the colony from Britain, mostly for petty crimes. And more recently for the Port Arthur massacre of April 1996, a mass shooting in which 35 people were killed and 23 wounded by a man who will remain nameless. We didn’t go near the penitentiary, electing instead to park in Safety Cove, the first bay and guess what? We had the place to ourselves. 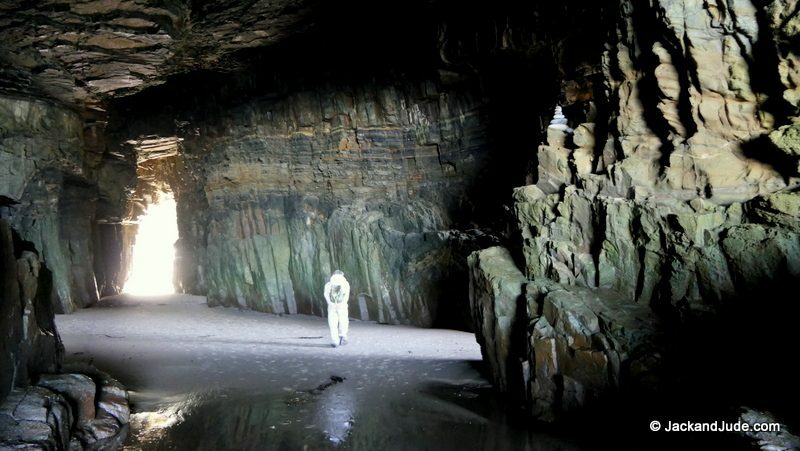 There we withstood a westerly blast in good holding sand with a bit weed, and when that blew out, we marched off to see what the Remarkable Cave offered. It lay just over the hill, accessible by tarmac and we soon found it to be rather popular. 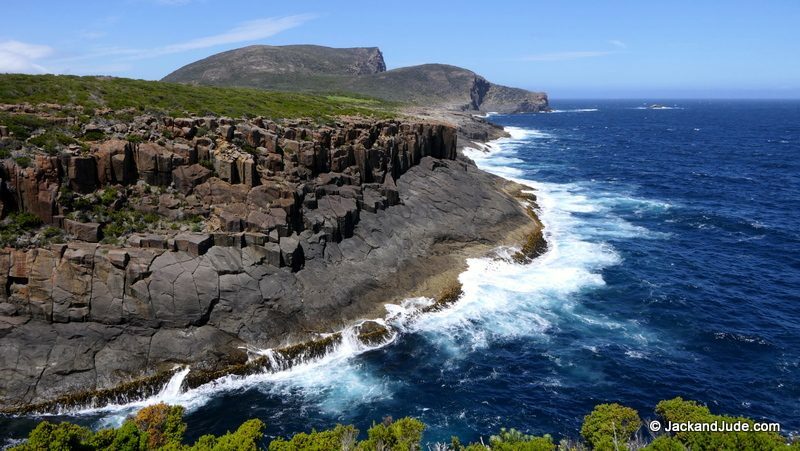 There must have been fifty vehicles parked at road’s end that held a magical view of blue sea bashing white against these gorgeous cliffs of reddish hexagonal dolerite. I wasn’t impressed by its popularity but by biding our time, we had our moment alone with a wonder of creation. 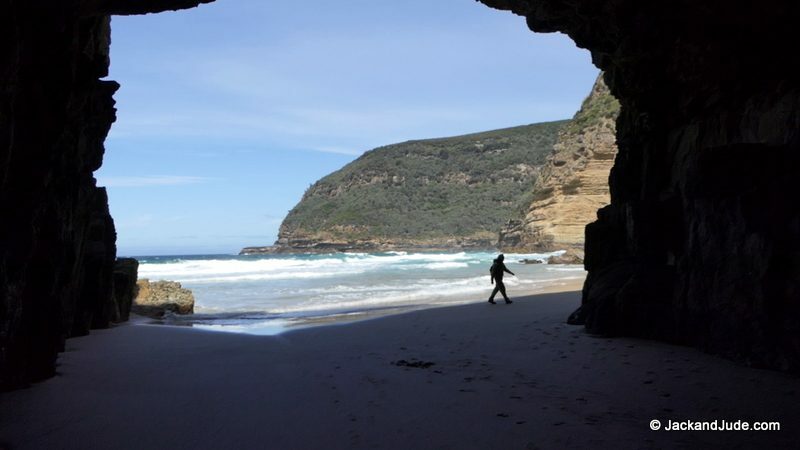 Fortunately for us, and a lot of others, the tide was out; so we could saunter safely through this amazing cave tunnel to the wonderful deep blue sea, breaking white on a clean buff beach which had one lone sea lion asleep basking under the midday sun. Hey, this is getting a bit long winded. 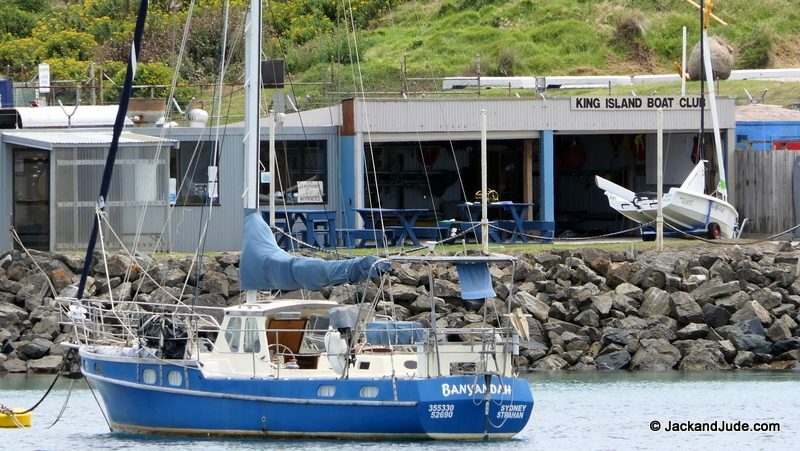 Too much detail, so I’ll speed ahead to say that we parked off the penitentiary only one night and found it too busy with giant powered Catamarans doing trips one after another, taking mostly Asian tourists around the bay, before moving on to quieter surrounds in Ladies Bay. A few nice restful days there found a window opening to move further along, which we took even though the day was forecast to get angry. Yep! Never sail the beginning of a front. 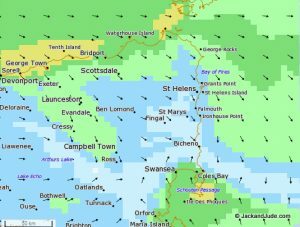 Those forecast Northeast winds crossing land hardly ever bring good sailing conditions, and they didn’t again as we rounded Cape Raoul and had to bash into headwinds to reach Wedge Island, where we motored hard to get into Nubeena. a lovely, narrow, well-protected pocket where I’m writing this. There’s just one quick skip across Storm Bay to our haul out destination. Australia Day was splendid here at Nubeena, but that can wait till next time.